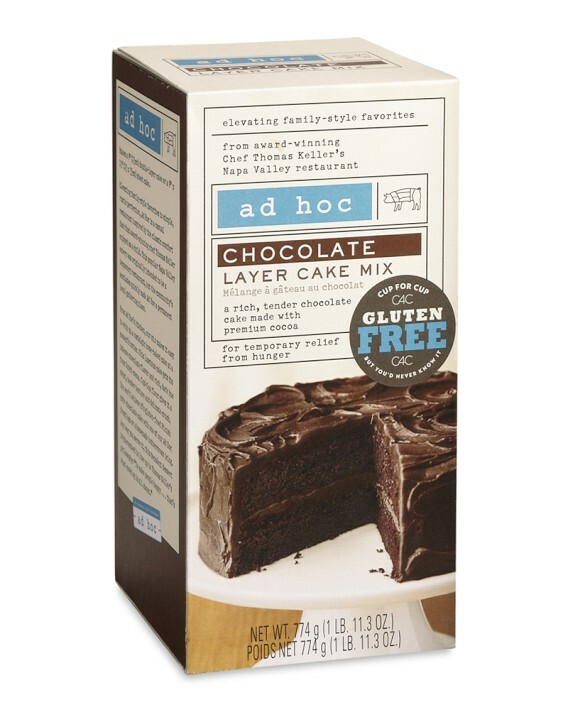 This chocolate cake was wildly delicious and one would never guess it was gluten-free! My mother in law has a plethora of gluten-free baking and food items around the house due to gluten intolerance. 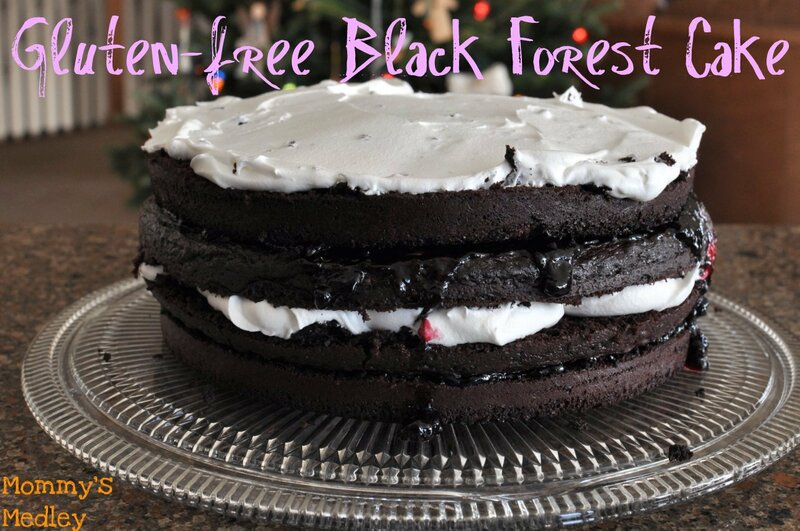 This particular cake was made from the Williams-Sonoma Ad Hoc Gluten Free Cake Mix. This mix is more expensive than others, but so delicious. It was baked according to the box directions in 2 cake pans. 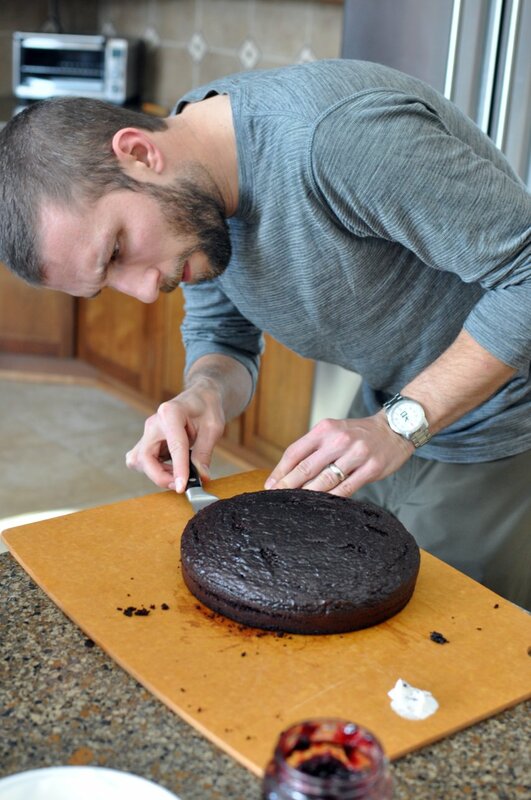 When they were cool enough to touch, Eric sliced them both in half, to create 4 thin cakes. To assemble the cake, place the first layer on a plate and spread with cherry topping. 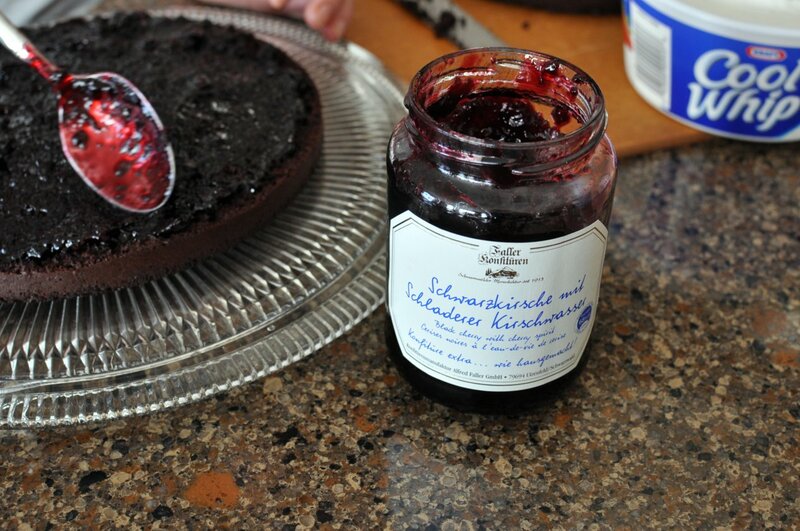 We used a jar all the way from Germany for a more authentic flavor. Extra thanks to Eric’s sister for popping that into my mother in law’s luggage before she headed back to the States. 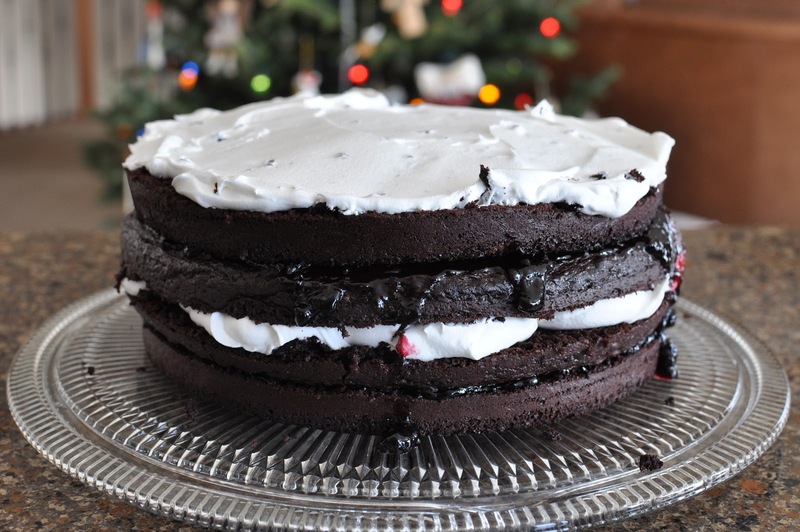 Place the second layer on top and cover in Cool Whip or real whipped cream. 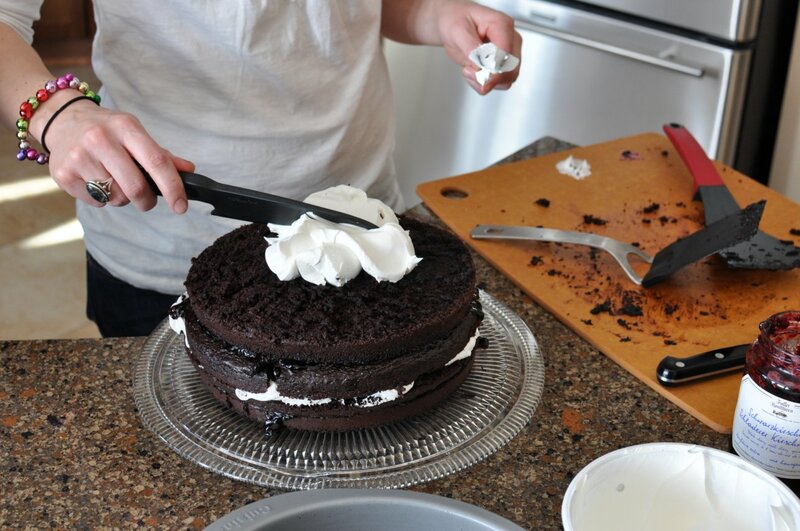 Repeat with the last two layers, ending with Cool Whip for the top layer. 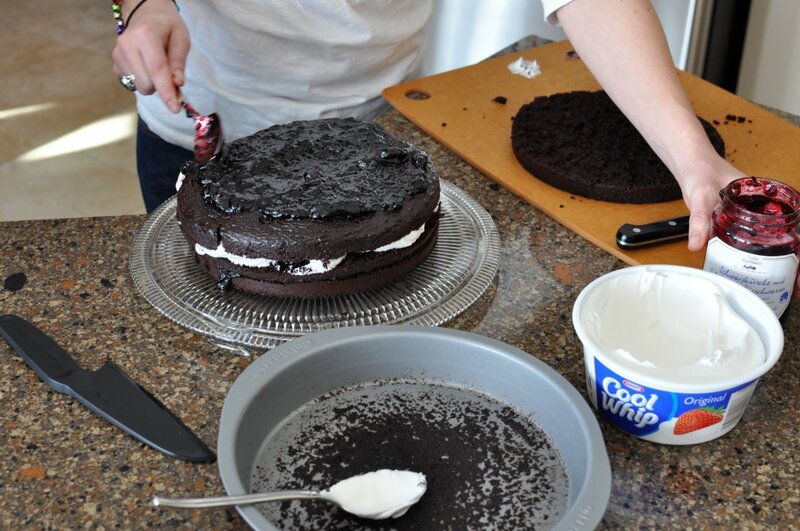 Note: a cooler cake will frost much easier. This cake was still a little too warm and we had a little bit of oozing due to this. It turned out to be a gorgeous cake. We sat down to an afternoon meal with gluten-free items. Pasta with shrimp, asparagus, and a pesto broth sauce for the main entree and a side salad of arugula, cherry tomatoes, and a mustard vinaigrette dressing (see below for the recipe). After our Christmas meal, we opened some gifts. 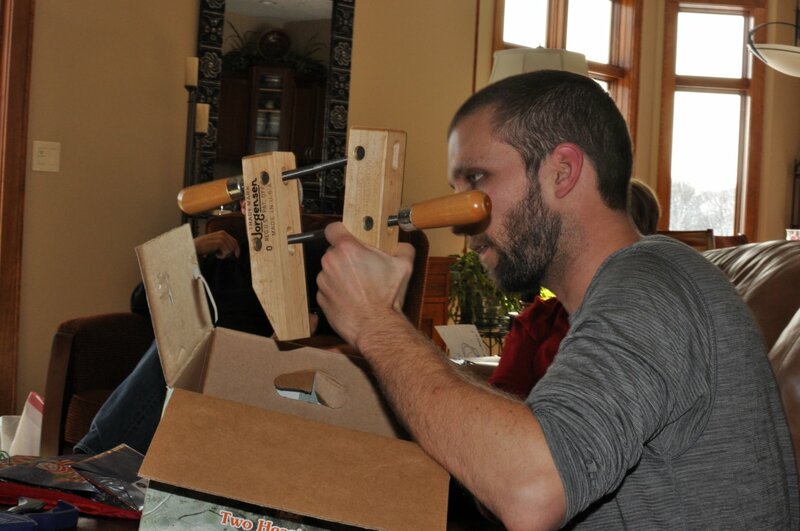 Eric received some very nice woodworking accessories. After digesting a bit, we ate our dessert. It was so good, I ate mine entirely too fast. My father in law nicely offered to look away while I licked my plate clean. I was so impressed with this simple and rewarding dessert. 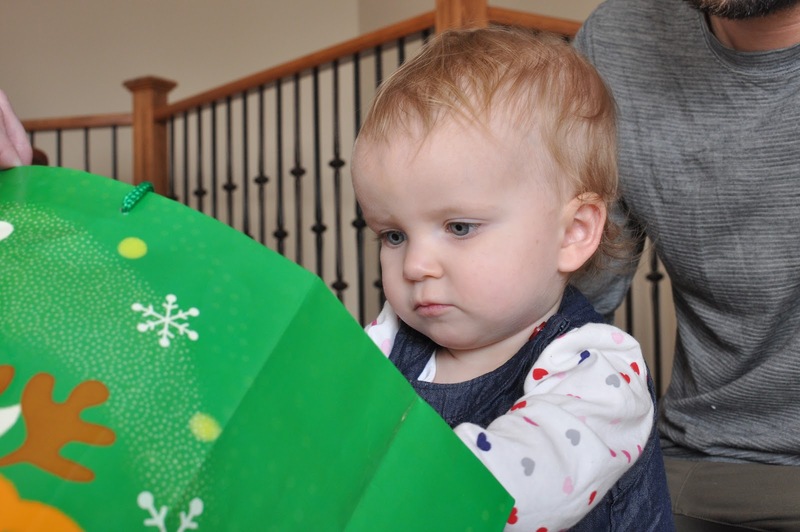 Greta finally awoke from her afternoon nap and had a few gifts herself to open. Poor thing was overwhelmed by Christmas this year. We have spread things out for her though and allowed for plenty of napping in between events. 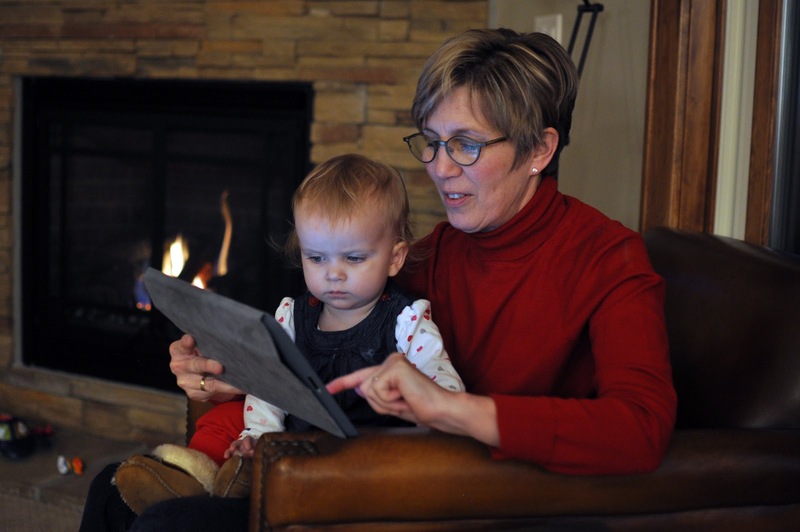 On Christmas Eve she tried to lay down on the floor and go to bed, after taking two naps prior to gift opening. Oh to be almost 2 again. 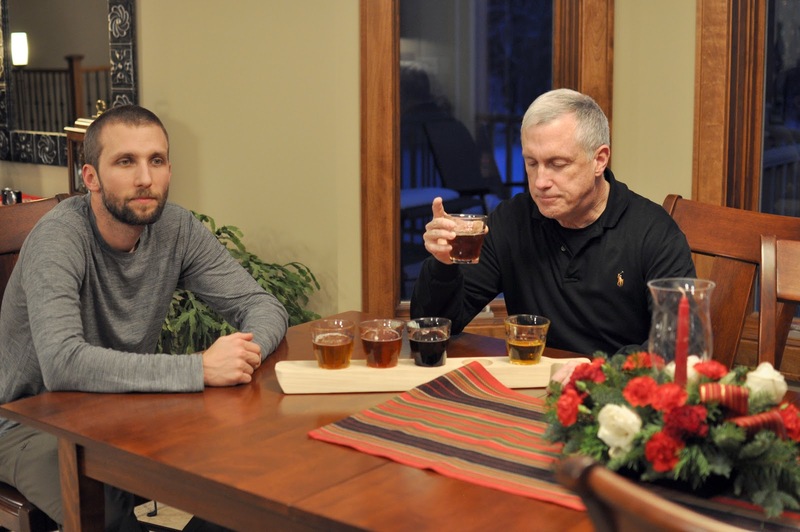 After gifts, Eric and his dad made use of a homemade gift – a beer flight paddle. Eric made sure to travel with North Carolina beers to sample as a Christmas treat. More on this flight paddle later. Brownie considered another Christmas nap or possibly a round of barking at deer. This dog hates deer, we have discovered on this trip. Mix together in a bowl 6 tablespoons olive oil, 3 tablespoons white balsamic vinegar, 2 teaspoons coarse stone ground mustard. Serve with salad of your choice. My grandmother’s birthday is Christmas Day. As kids, we would drive to Minneapolis to celebrate with her on Christmas Day. We have started celebrating it on Christmas Eve now that she lives in Des Moines. 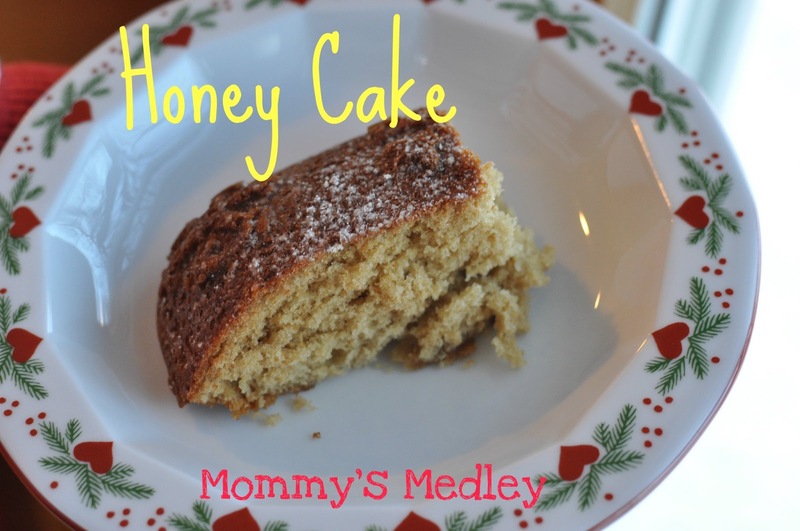 This year, I decided to use this cake recipe since her nickname is Honey and a Christmas birthday is often overlooked and cake left out completely. 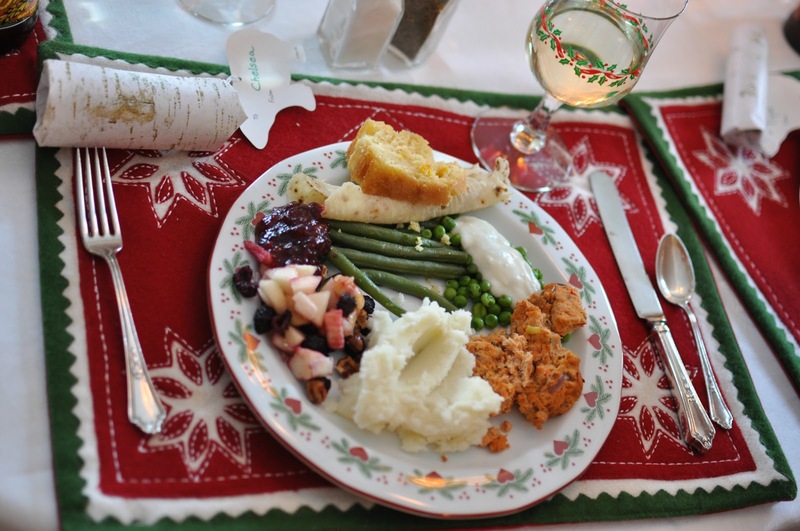 It comes from my all-time favorite cookbook – The Joy of Cooking. 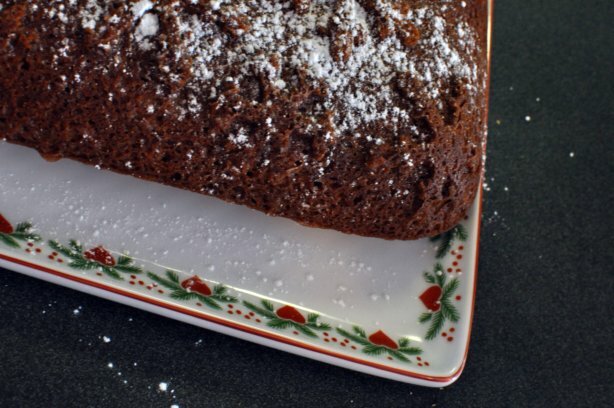 I liked the flavoring of this cake – spicy and fit it in well with the Christmas season’s flavors. 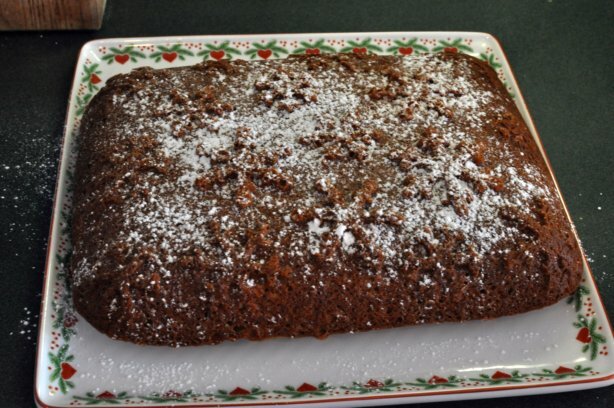 Two eggs and butter don’t hurt in making this cake delicious. 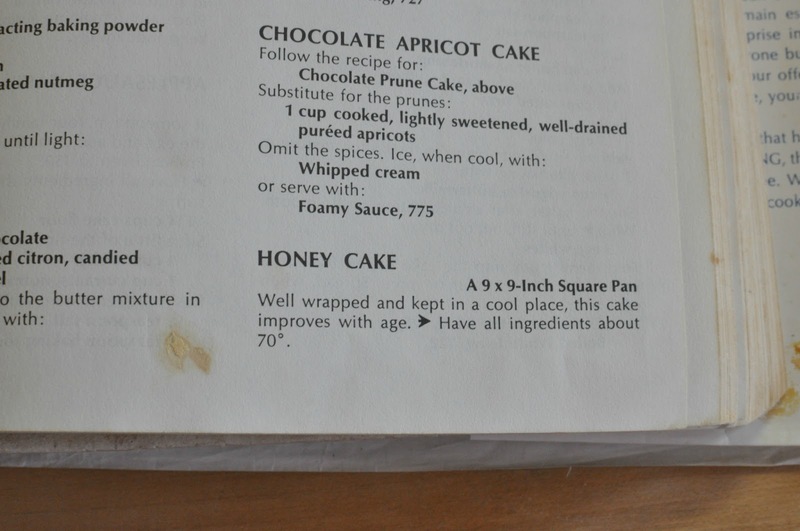 The additional flavoring of honey and coffee intrigued me and was the final selling point in choosing this for my grandmother’s birthday cake. 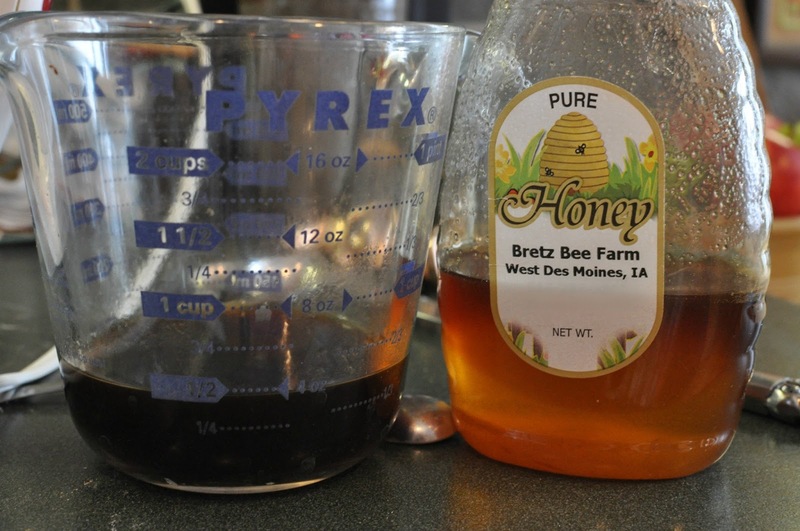 I used honey from my parents’ neighbors’ hives – delicious! This thick batter worked perfectly for the winter pan my mom chose. I was hesitant to use the fancy snowflake pan due to my past mishaps with decorative pans. However, my sister and mom both assured me that they would help remove the cake from the pan. It popped out easily with the aid of cooking spray and only waiting 1 minute after coming out of the oven.. 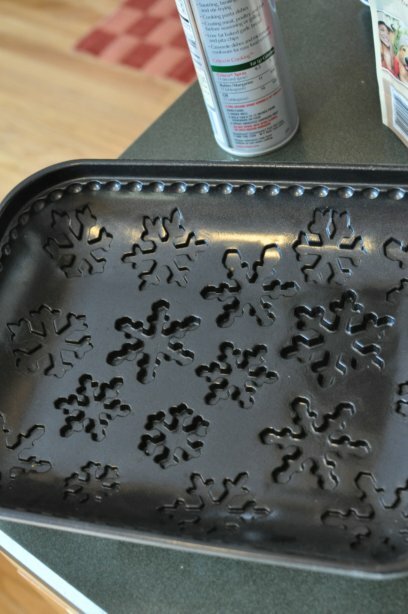 They don’t make this particular cake pan anymore, but here is another stunning Nordic Ware Snowflake Pan . 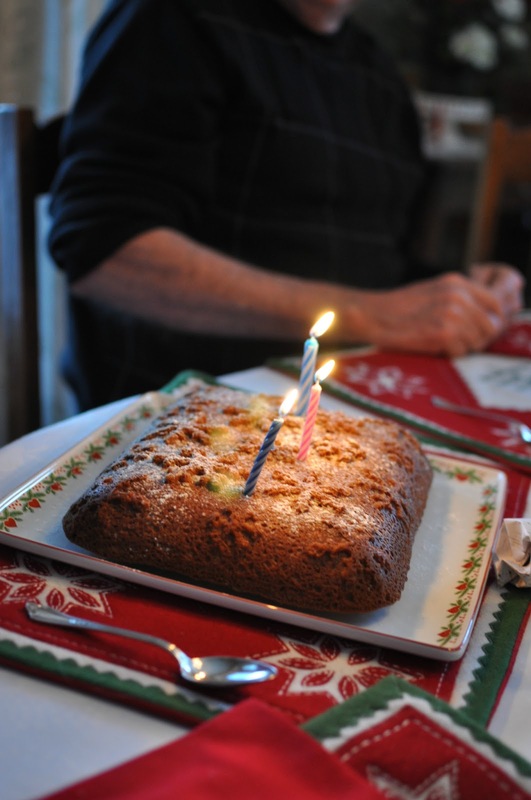 A dusting of confectioner’s sugar and a pretty festive platter made this the perfect Christmas birthday dessert. Next year we will have to go all out with 89 candles! 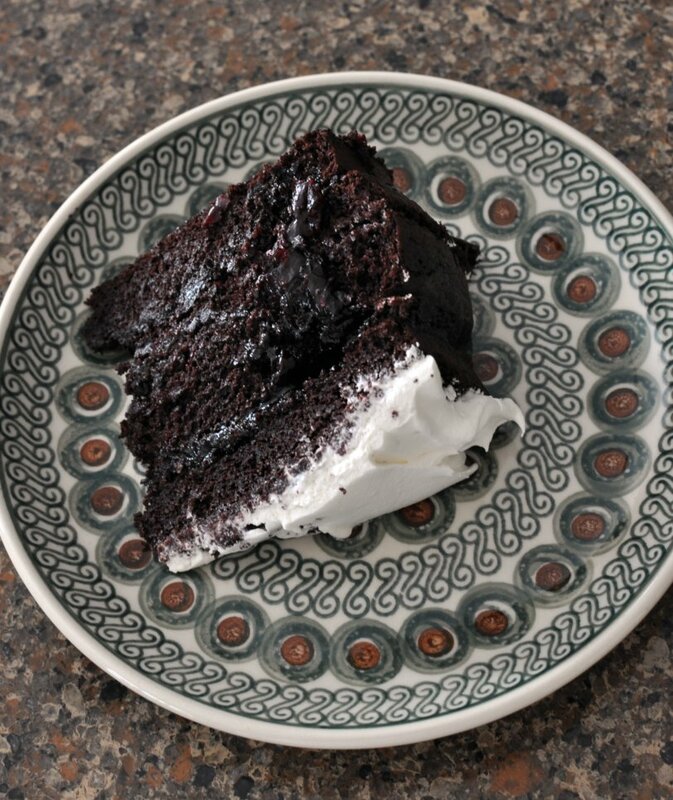 We served this cake with cinnamon ice cream and peppermint ice cream. My sister and grandmother and me. 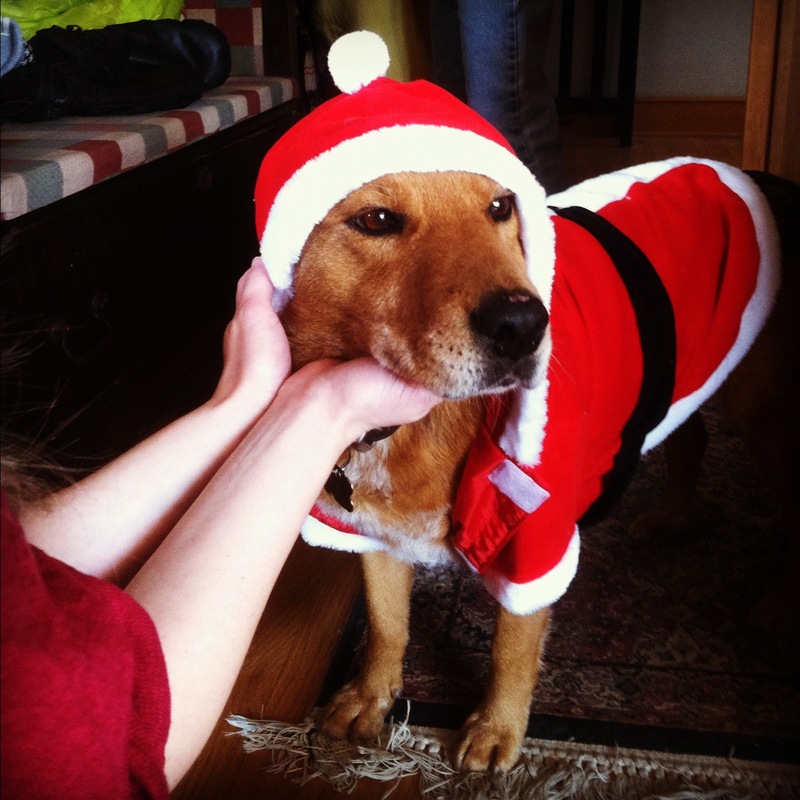 The Christmas Eve celebration ended with a rousing game of Yahtzee and even Brownie got in on the the festivities. My sister loves to make this dog look as cute as can be. 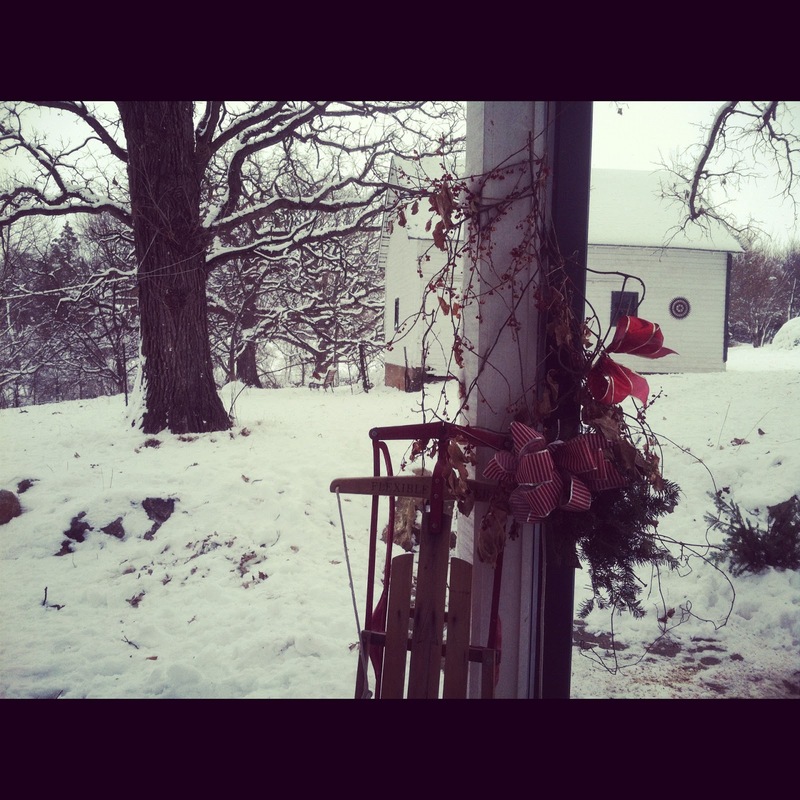 It even snowed a little on Christmas Eve. 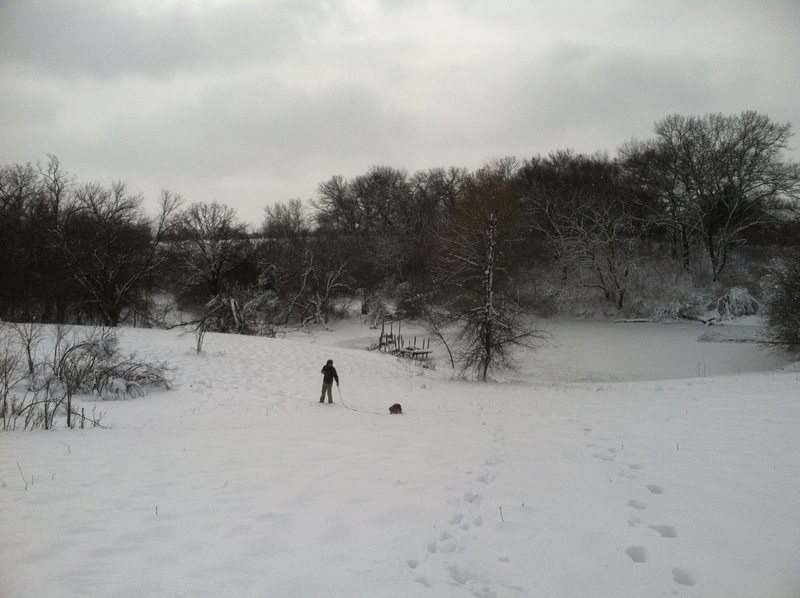 A walk with Brownie to the snowy pond was a perfect end to Christmas Eve. 1. 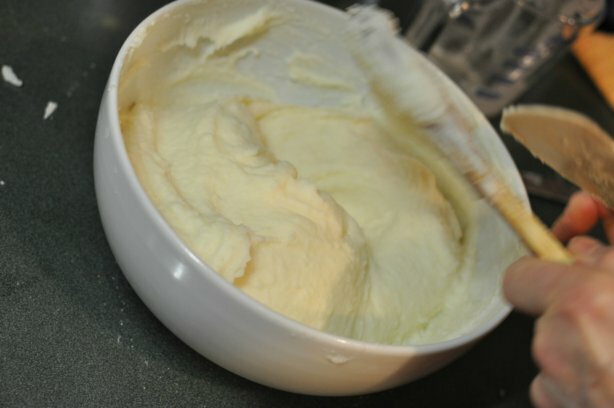 Cream together 1/2 cup butter and 1/2 cup sugar. Add 2 eggs and continue creaming until light and fluffy. 2. Sift together 2 cups all-purpose flour, 1/2 teaspoon baking soda, 1 teaspoon double-acting baking soda, 1/2 teaspoon cinnamon, 1/4 teaspoon ginger, 1/4 teaspoon salt. 3. 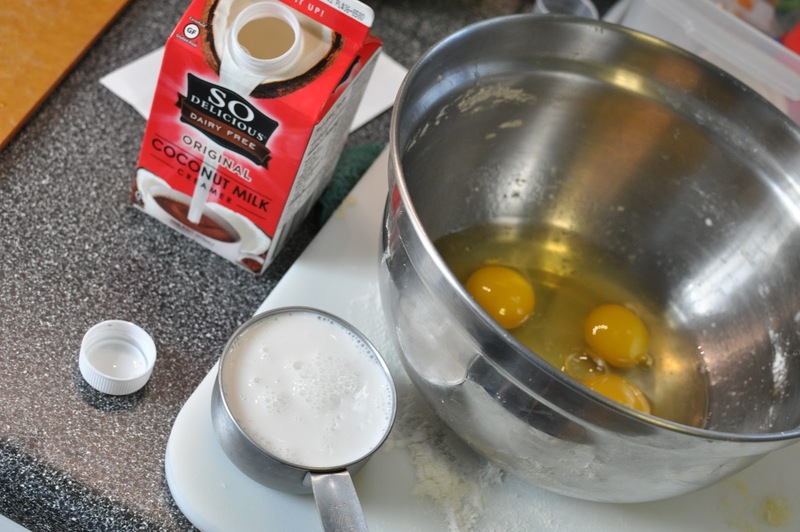 Add the sifted ingredients to the egg mixture alternating in three parts with 1/2 cup honey and 1/2 cup cool strong coffee. Stir in 1/2 teaspoon vanilla. 4. 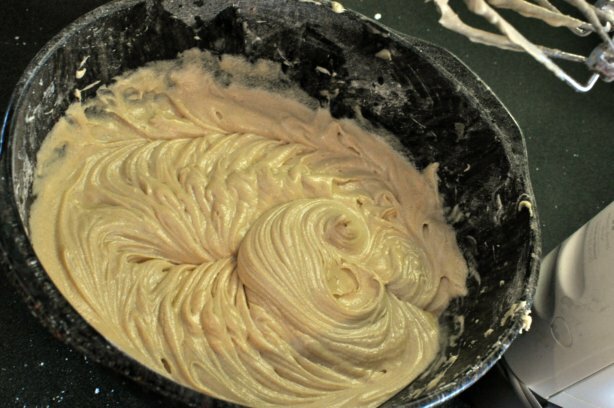 Pour batter into a greased 9 x 9″ pan and bake for 30 minutes at 350 degrees. Dust top with confectioner’s sugar. 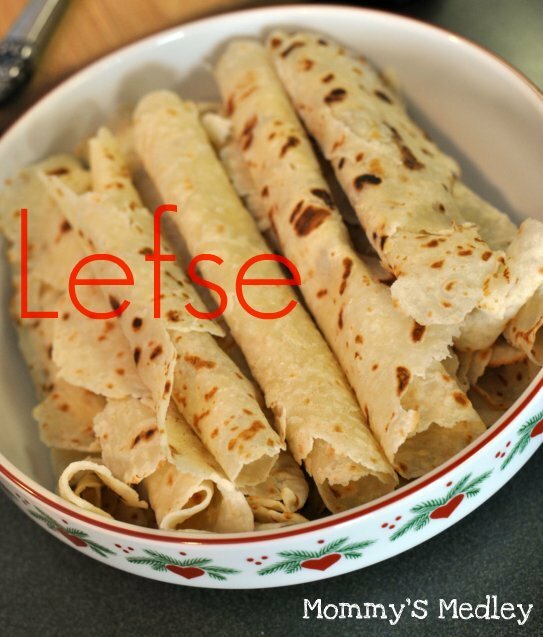 Christmas means lefse time in our household! Christmas has always been celebrated on my side of the family on Christmas Eve. Originally, it was just the four of us – my parents, sister, and me. We would make Christmas dinner, go to the candlelight church service, and then come home to bundle up and ice skate on the pond by the light of only the moon and a bonfire. After skating, we would head back to the house and open the family gifts. Then, we would go to bed with visions of sugar plum fairies dancing through our heads. On Christmas morning, we would awake early, open Santa gifts and our stockings, eat too much candy, then force down some healthy breakfast. 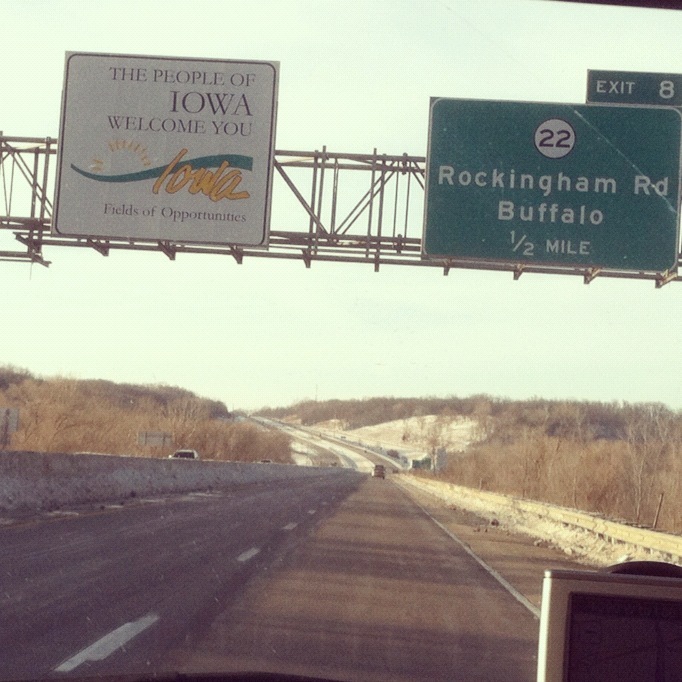 We would then load up the car and head off to Minneapolis to visit the extended family. 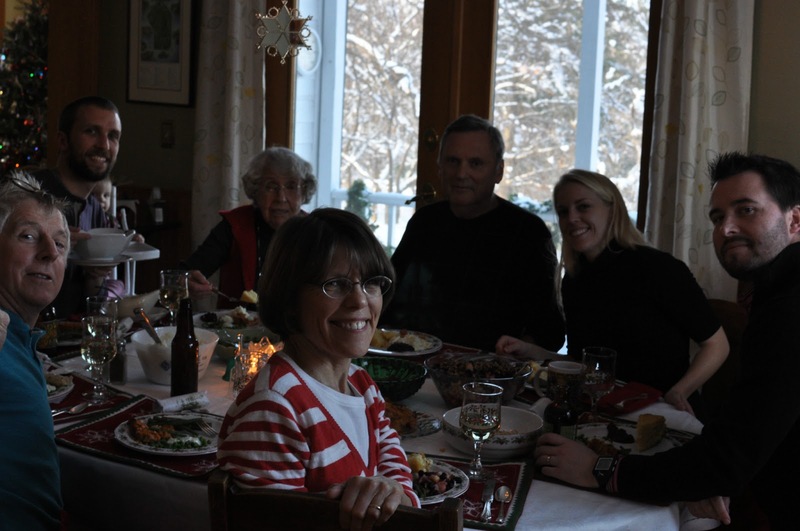 As more family members were added to my family, this turned out to be a fortunate way to celebrate Christmas for in laws and made it easier to celebrate with Eric’s family on Christmas Day. The older I get, the more I enjoy Christmas. 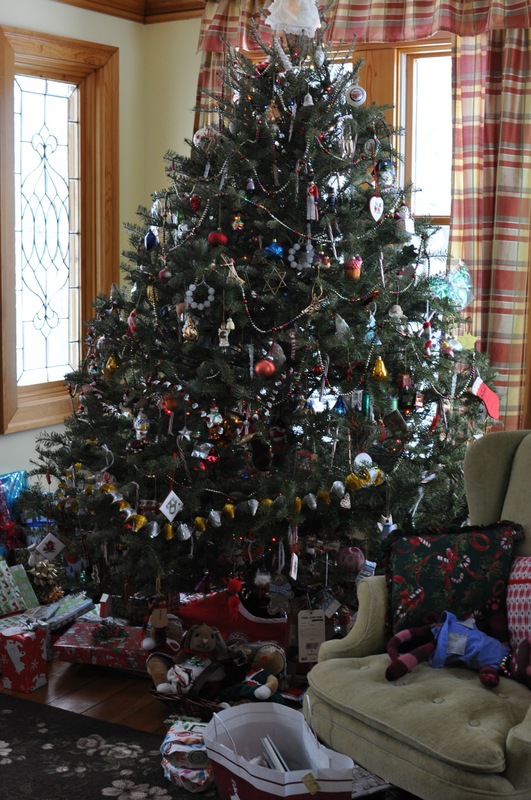 To see Christmas through Greta’s eyes has made Christmas the most joyful it has ever been. This year, we started Christmas Eve by making lefse in the morning. My mom mixed up the dough for it the morning before. Lefse is a Norwegian treat made from potatoes and cooked on a special lefse griddle. They look like something between a crepe and a tortilla but taste like nothing else. To those who have tasted homemade lefse, store bought is not even an option. As a kid, I remember my parents making lefse on a cast-iron skillet and filling the house with smoke. My mother remembers her grandparents making lefse and using all Norwegian to hide the bad words from the kids. Lefse can be tricky and requires special cooking utensils, which I will show in a moment. This year I knew I had to document this wonderful food, some day I will be relied upon to make this delicacy and I had better start paying attention and stop taking it for granted! Just so you are prepared, this is a lengthy post – making lefse is quite the process. 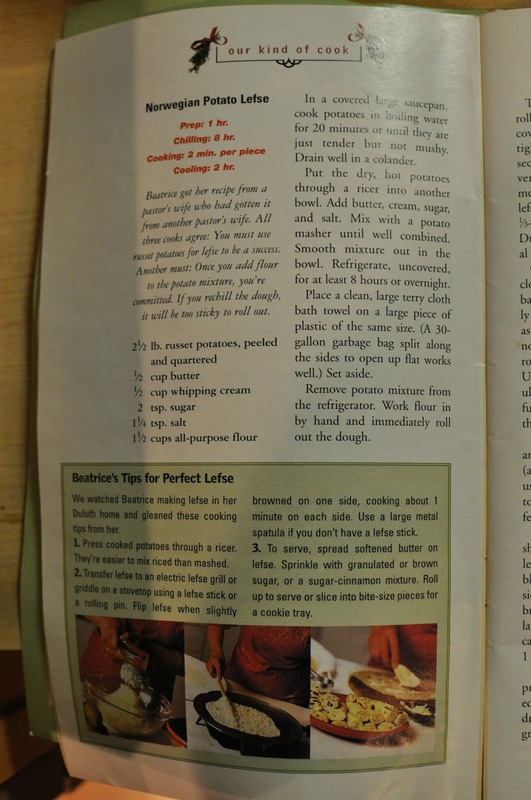 The recipe my mom uses is from Beatrice Ojakangas from Duluth, Minnesota. 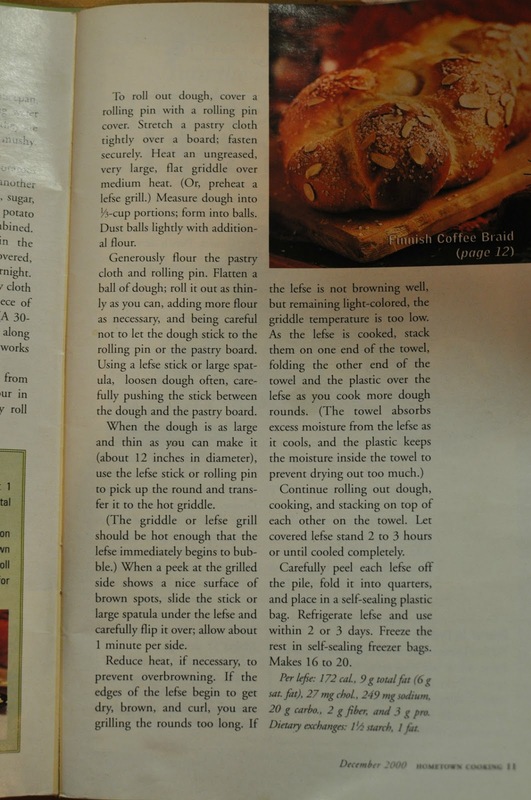 The recipe is from the Better Homes and Gardens publication Hometown Cooking. 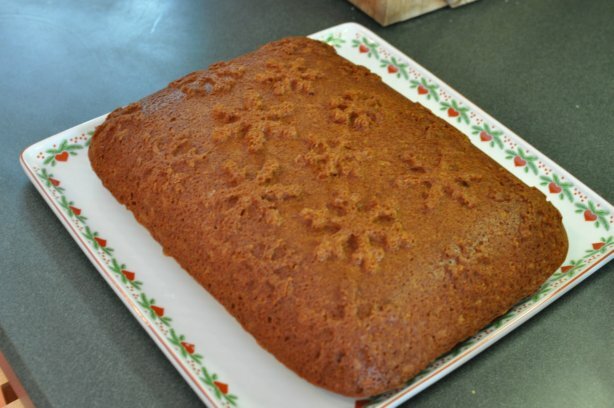 Beatrice got her recipe from a pastor’s wife who had gotten it from another pastor’s wife. All three cooks agree: You must use russet potatoes for lefse to be a success. Another must: Once you add flour to the potato mixture, you’re committed. If you re chill the dough, it will be too sticky to roll out. According to Beatrice there are a couple tips for making perfect lefse. 1. 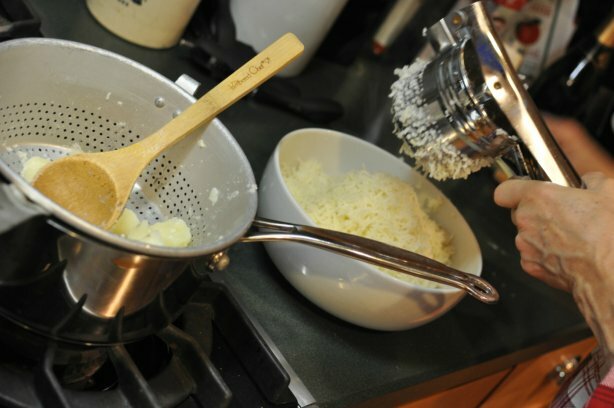 Press cooked potatoes through a ricer. They are easier to mix than mashed. 2. 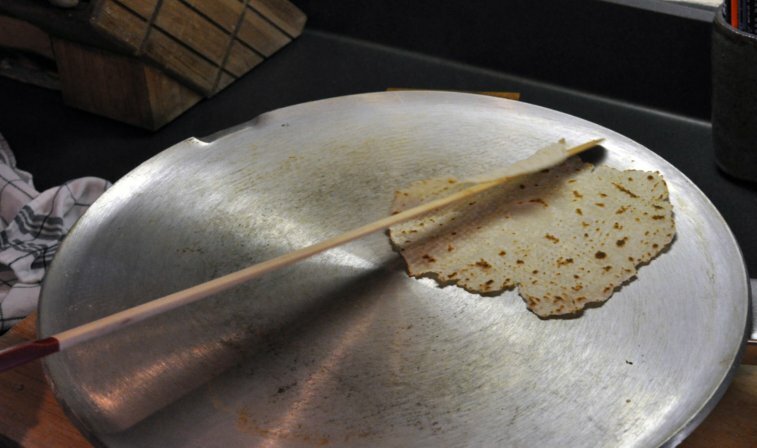 Transfer lefse to an electric lefse grill or griddle on a stove top using a lefse stick or rolling pin. Flip lefse when sightly browned on one side, cooking about 1 minute on each side. Use a large metal spatula if you do not have a lefse stick. 3. To serve, spread softened butter on lefse. Sprinkle with a sugar-cinnamon mix. Roll up to serve. There are a couple of tools that will make lefse making a lot smoother for you. A great place to purchase these items is at Ingebretsen’s in Minneapolis. They have quite the variety of lefse goodies. 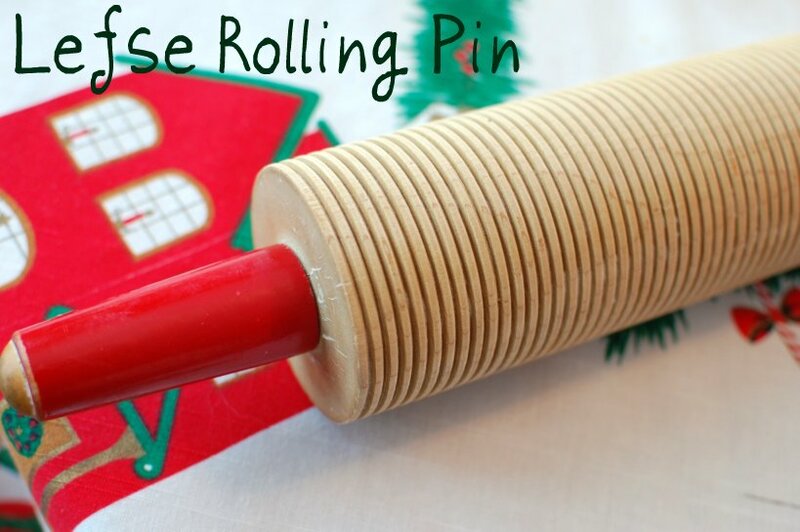 The grooves in the Lefse Wood Rolling Pin allow flour to be pressed in, preventing the lefse from sticking too much and creating a more even rolling thickness. 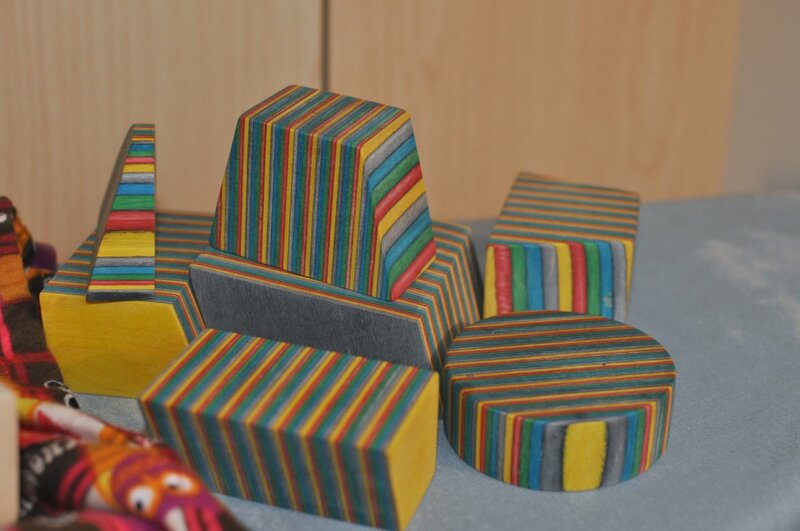 The Pastry Board and Cloth Set enable a better rolling surface. 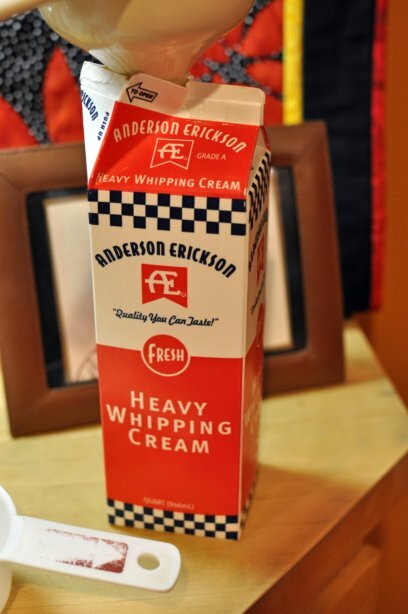 It will also help in creating an even size of lefse pieces. The long, thin Lefse Turning Stick make moving the dough and flipping the cooking lefse a breeze. 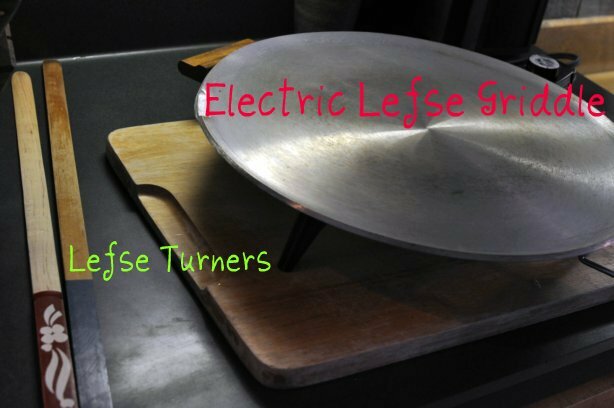 The electric Heritage Lefse Grill is a must in keeping the temperature consistent and preventing your house from becoming a smoky mess. Since the griddle gets so hot and you use it for over an hour, you’ll want to put a wooden board under the griddle. It will still warm up the board, but your counter should be fine. If you are ready, here we go! In a large covered saucepan, cook 2-1/2 lb. russet potatoes, peeled and quartered in boiling water for 20 minutes or until they are just tender but not mushy. Drain well in a colander. Put the dry, hot potatoes through a ricer into another bowl. Mix well and smooth mixture out in the bowl. Refrigerate, uncovered, for at least 8 hours or overnight. 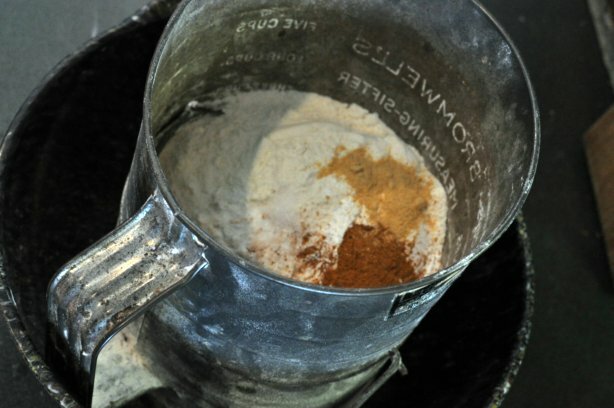 Remember, once you start adding flour, you are committed. Remove potatoes from the refrigerator, work 1-1/2 cups flour in by hand and immediately being the hour-long process of rolling out the dough. 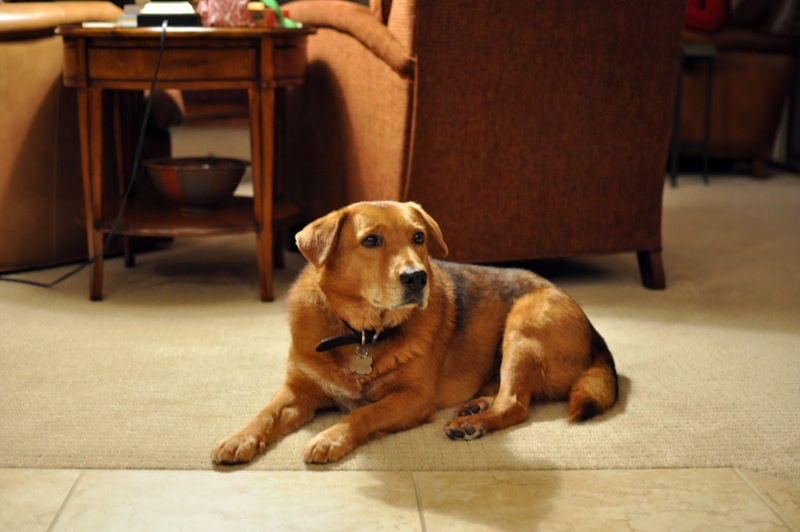 You need a helpful partner to make this process go quicker and smoother. Otherwise, you are looking at about 3 hours of cooking and rolling time. Prepare terry cloth towels and a large piece of plastic – plastic wrap or a garbage bag cut down the sides. The plastic should be the same size as the towel. These will be used to cover the cooked lefse as you roll and cook more. 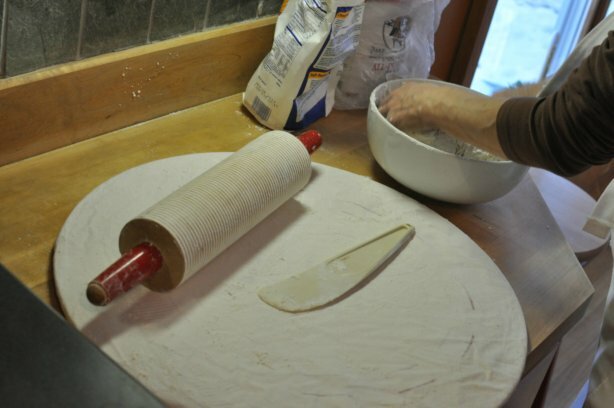 To roll out dough, cover a lefse rolling pin in flour. 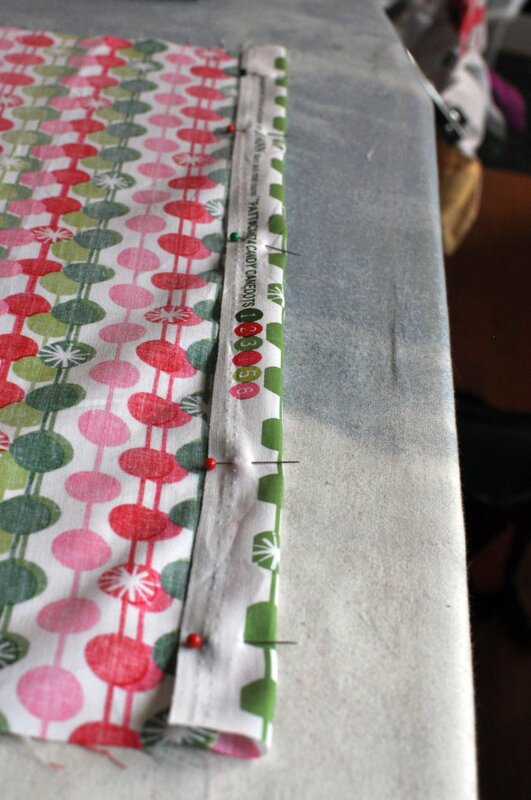 Stretch your pastry cloth over the board; fasten securely. 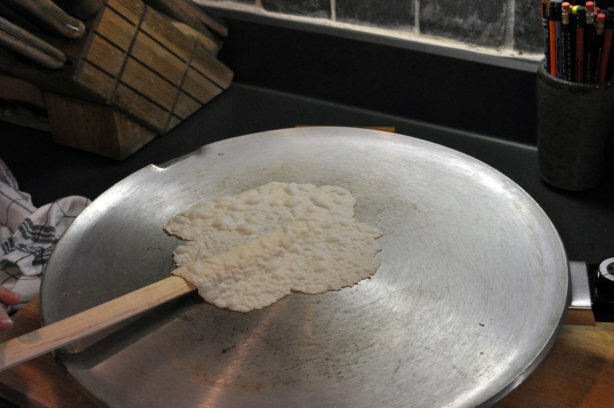 Heat the ungreased griddle over medium heat, or preheat lefse griddle. 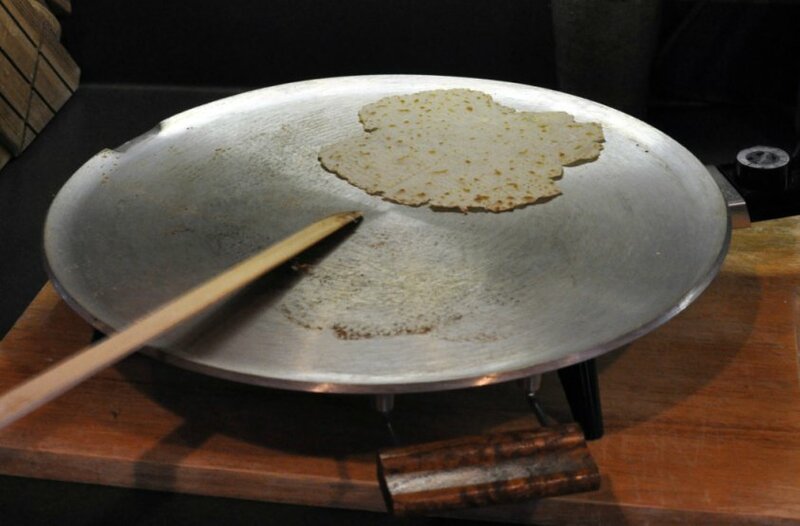 Without a lefse griddle, you will be extremely frustrated, as the temperature for cooking lefse should be at 500 degrees. You and your partner will be hollering, windows will be open, and smoke alarms will be ringing without the lefse griddle. Trust me, I know. Generously flour the pastry cloth and rolling pin. Flatten a ball of dough, the size of a walnut. 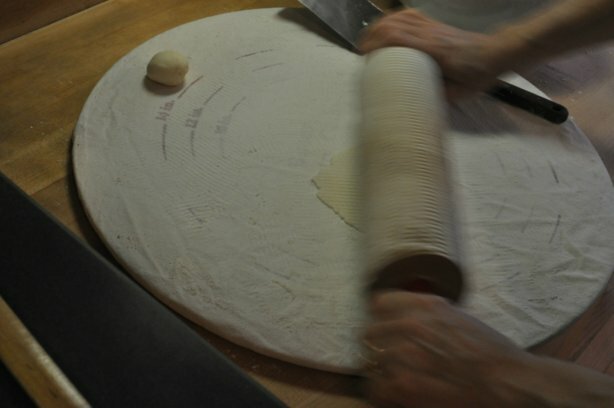 Roll out as thin as you can, adding more flour as necessary, and being careful not to let the dough stick to the rolling pin or the pastry board. Using a lefse stick, loosen the dough often, carefully pushing the stick between the dough and the pastry board. When the dough is as large and as thin as you can make it, use the lefse stick to pick up the round and transfer it to the hot griddle. 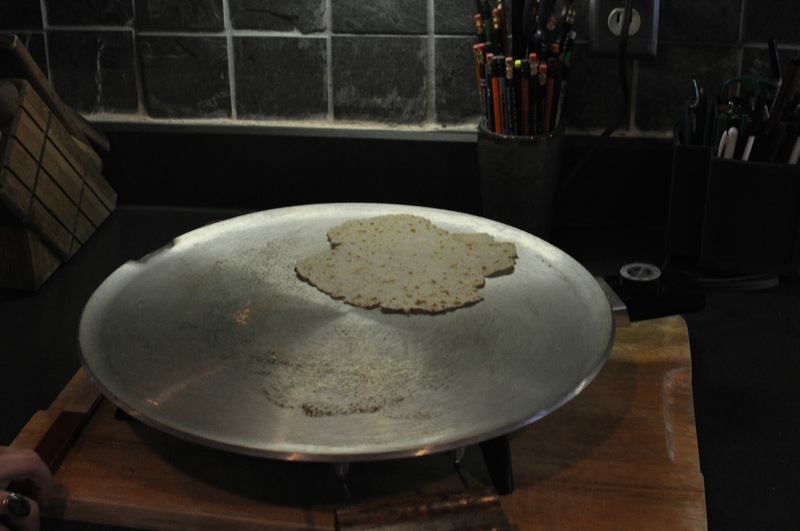 The lefse griddle should be hot enough that the lefse immediately begins to bubble, as shown above. When a peek at the cooking side shows a surface of nice brown dots, see above, slide the stick under the lefse, and carefully flip it over. Allow about 1 minute per side. Reduce heat, if necessary, to prevent over browning. If the edges of the lefse begin to get dry, brown, and curl, you are grilling the rounds too long. If the lefse is not browning well, but remaining light-colored, the griddle temperature is too low. The nice thing about having a lefse griddle, is keeping the temperature consistently high – 500 degrees. 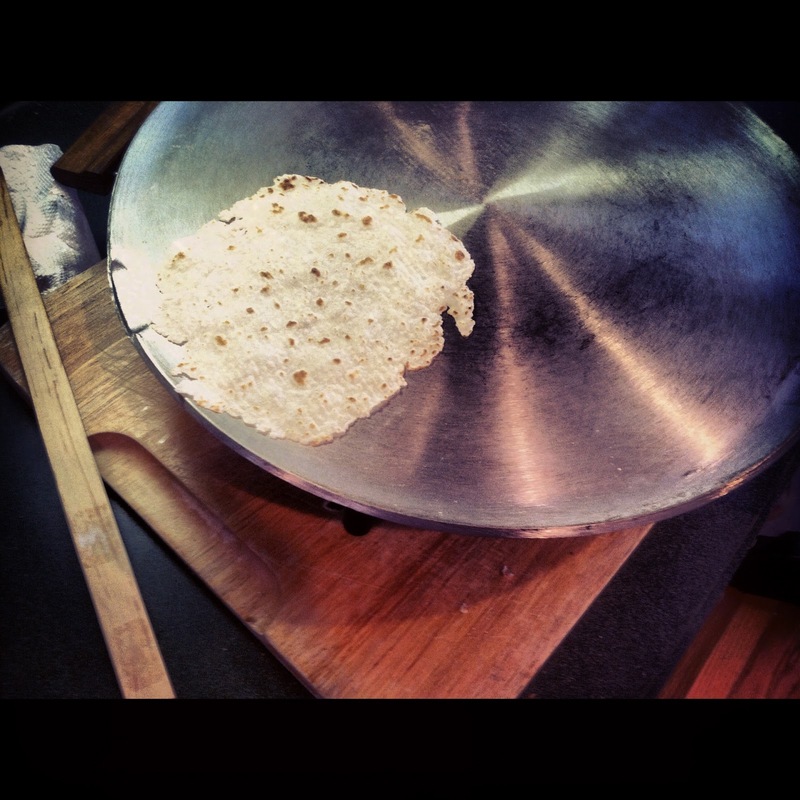 When flour begins to build up on the lefse griddle, use a wadded up dry paper towel to wipe it clean. This will prevent smoking and scorching of the lefse. As the lefse is cooked, stack them on one end of a terry cloth towel, folding the other end of the towel and the plastic over the lefse as you cook more dough rounds. The towel absorbs excess moisture from the lefse as it cools, and the plastic keeps the moisture inside the towel to prevent drying out too much. Continue rolling out dough, cooking, and stacking on top of each other on the towel. Let covered lefse stand 2 to 3 hours or until cooled completely. 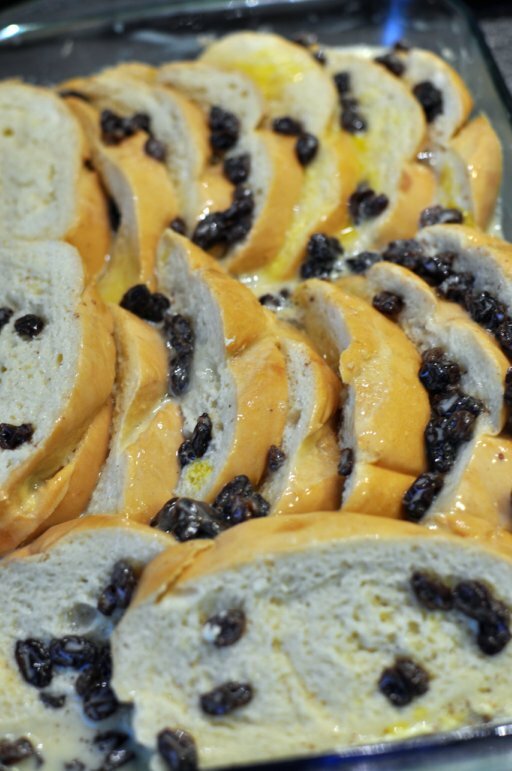 To serve immediately, spread with softened butter and roll up to eat. You may also add a sprinkling of cinnamon and sugar, although no real Norwegian would adulterate their lefse in such a way. Our lefse is ready for our Christmas meal. 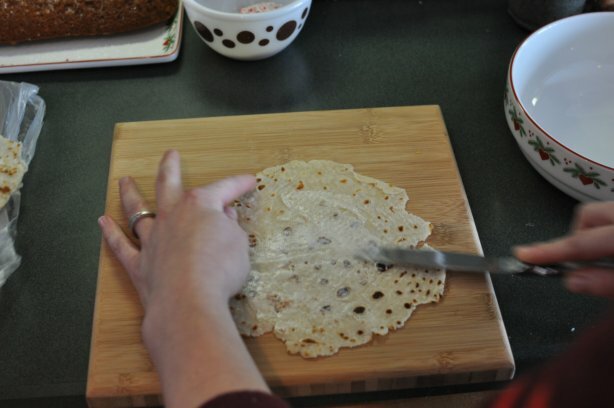 To store lefse, carefully peel each lefse off the pile, fold it into quarters, and place in a self-sealing plastic bag. Refrigerate lefse and use within 2 or 3 days. Freeze the rest in freezer bags. 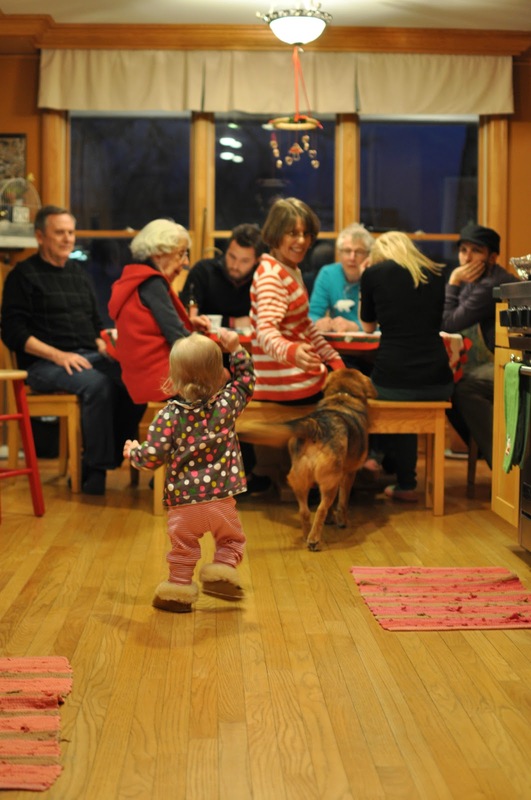 After making lefse and Christmas dinner we prepared to sit down and enjoy one another’s company. 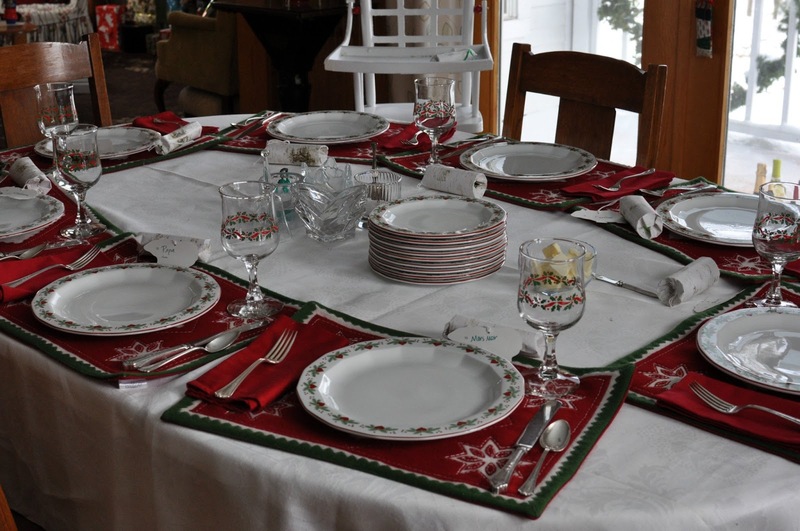 My mom set the table in a festive Christmas setting of Heart & Pine china, white linens, and Scandinavian looking snowflake place mats. Instead of our usual poppers, my mom created tubes with quotes inside for everyone to share aloud with the group. The quote tubes were labelled with sparkly polar bears. Guests were: my parents, Eric, my grandmother, neighbor Gail, and my sister and her husband Brady. 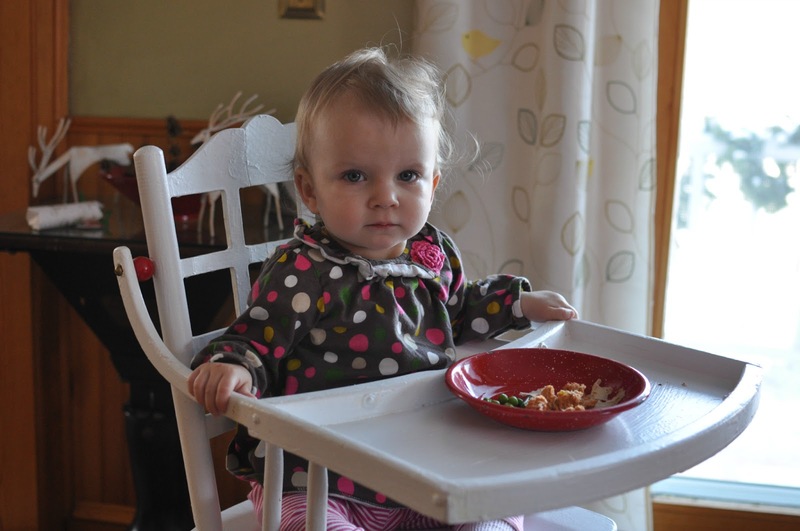 Greta had her own place in her highchair. Dinner was salmon cakes, mashed potatoes, green beans, cornbread, lefse, peas with white sauce, cranberry sauce, and fruit salad. 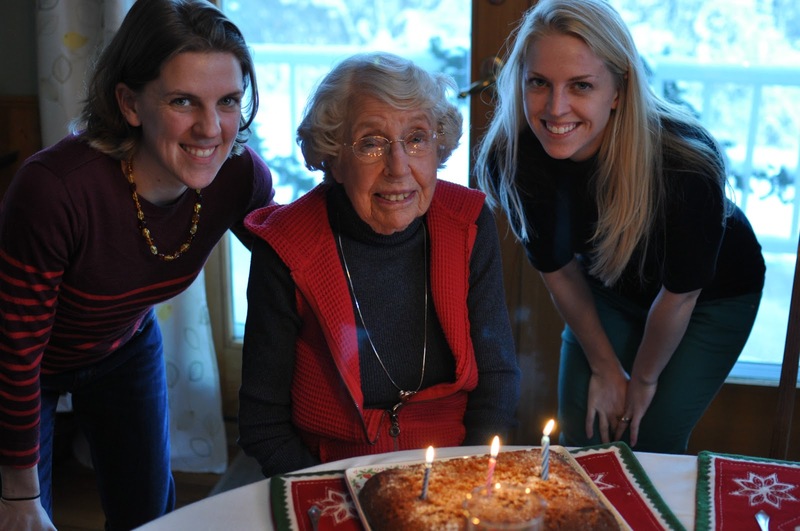 More on cake and my grandmother’s birthday celebration tomorrow. 1. In a large covered saucepan, cook 2-1/2 lb. russet potatoes, peeled and quartered in boiling water for 20 minutes or until they are just tender but not mushy. Drain well in a colander. 2. 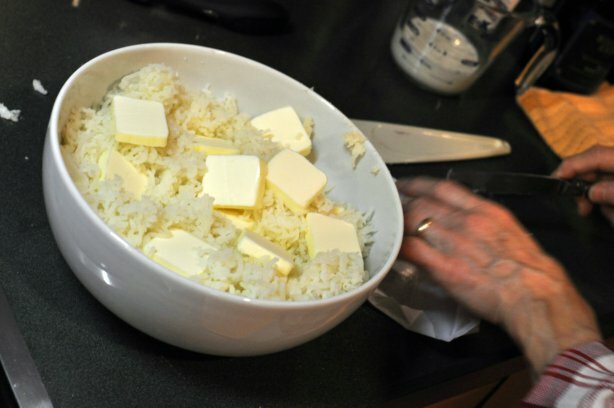 Put the dry, hot potatoes through a ricer into another bowl. 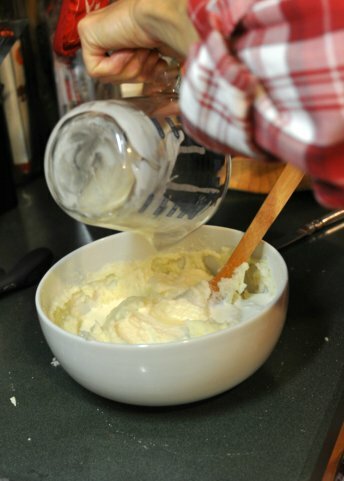 Add 1/2 cup butter, 1/2 cup whipping cream, and 2 teaspoons sugar. Mix well and smooth mixture out in the bowl. Refrigerate, uncovered, for at least 8 hours or overnight. 3. Remove potatoes from the refrigerator, work 1-1/2 cups flour in by hand and immediately being the hour-long process of rolling out the dough. 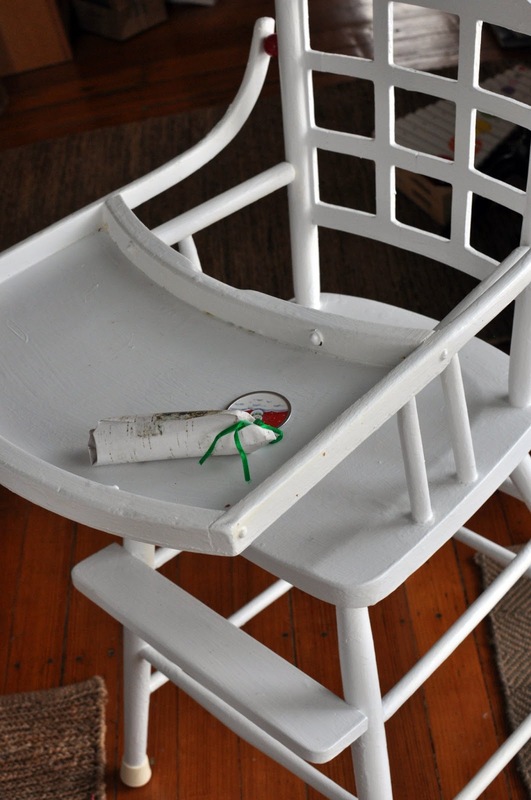 Prepare terry cloth towels and a large piece of plastic – plastic wrap or a garbage bag cut down the sides. The plastic should be the same size as the towel. These will be used to cover the cooked lefse as you roll and cook more. 4. 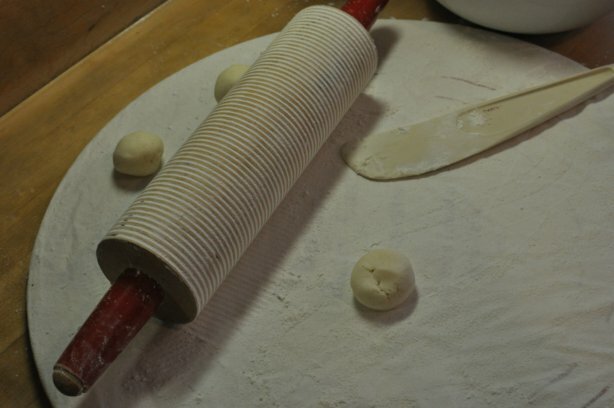 To roll out dough, cover a lefse rolling pin in flour. 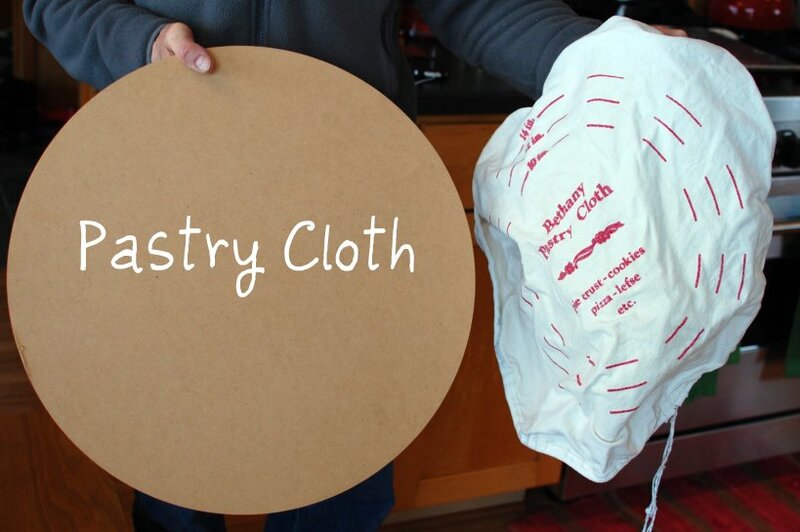 Stretch your pastry cloth over the board; fasten securely. Heat the ungreased griddle over medium heat, or preheat lefse griddle. Generously flour the pastry cloth and rolling pin. Flatten a ball of dough, the size of a walnut. 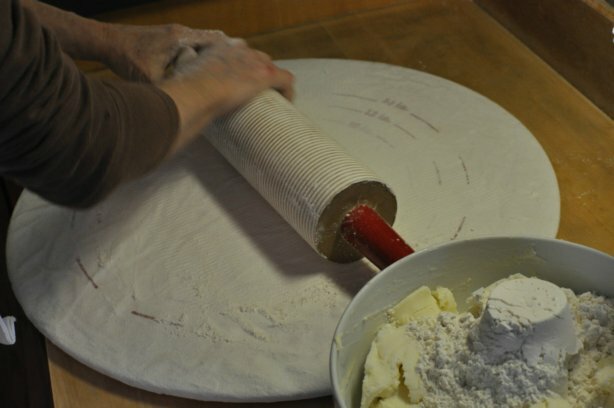 Roll out as thin as you can, adding more flour as necessary, and being careful not to let the dough stick to the rolling pin or the pastry board. Using a lefse stick, loosen the dough often, carefully pushing the stick between the dough and the pastry board. 5. When the dough is as large and as thin as you can make it, use the lefse stick to pick up the round and transfer it to the hot griddle. 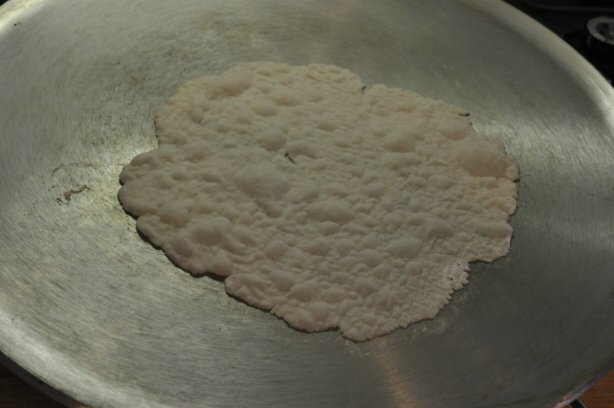 The lefse griddle should be hot enough that the lefse immediately begins to bubble, as shown above. When a peek at the cooking side shows a surface of nice brown dots, see above, slide the stick under the lefse, and carefully flip it over. Allow about 1 minute per side. Reduce heat, if necessary, to prevent over browning. If the edges of the lefse begin to get dry, brown, and curl, you are grilling the rounds too long. If the lefse is not browning well, but remaining light-colored, the griddle temperature is too low. 6. As the lefse is cooked, stack them on one end of a terry cloth towel, folding the other end of the towel and the plastic over the lefse as you cook more dough rounds. The towel absorbs excess moisture from the lefse as it cools, and the plastic keeps the moisture inside the towel to prevent drying out too much. Continue rolling out dough, cooking, and stacking on top of each other on the towel. Let covered lefse stand 2 to 3 hours or until cooled completely. 7. To serve immediately, spread with softened butter and roll up to eat. You may also add a sprinkling of cinnamon and sugar, although no real Norwegian would adulterate their lefse in such a way. 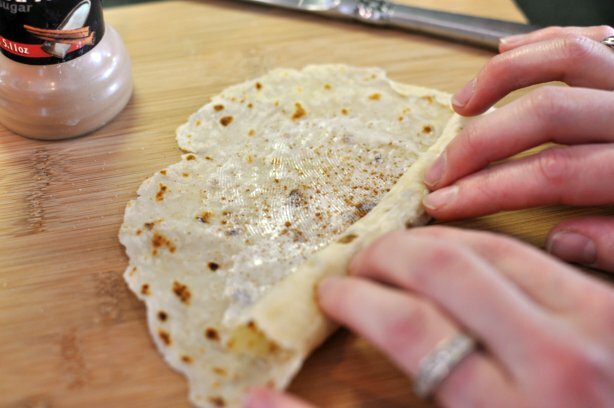 To store lefse, carefully peel each lefse off the pile, fold it into quarters, and place in a self-sealing plastic bag. Refrigerate lefse and use within 2 or 3 days. Freeze the rest in freezer bags. Home for Christmas via cell phone photos. 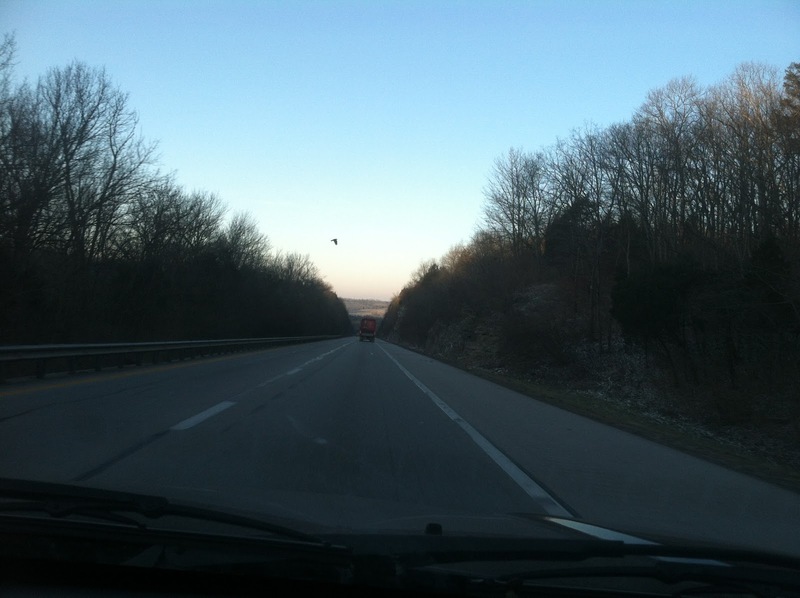 We left after work and headed west to avoid the snow storms in West Virginia and Virginia. 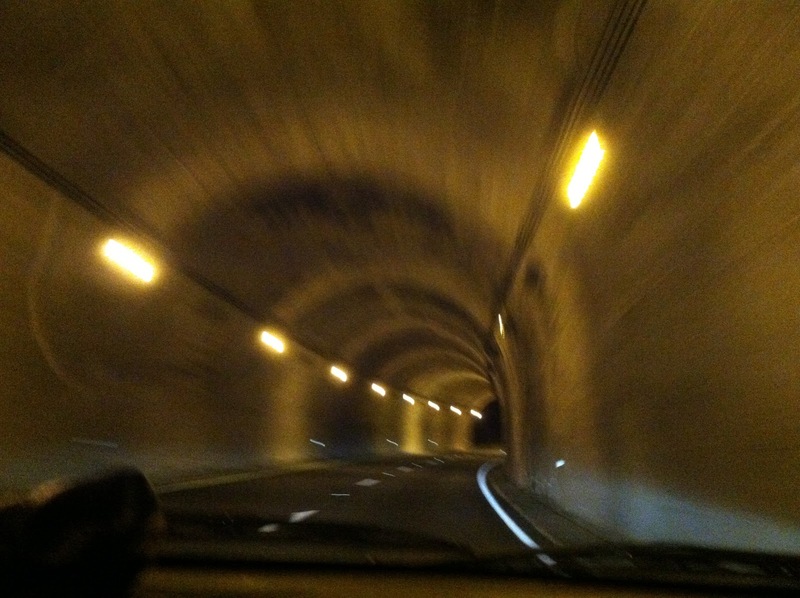 We hit the mountains of Western North Carolina and Tennessee in the dark. 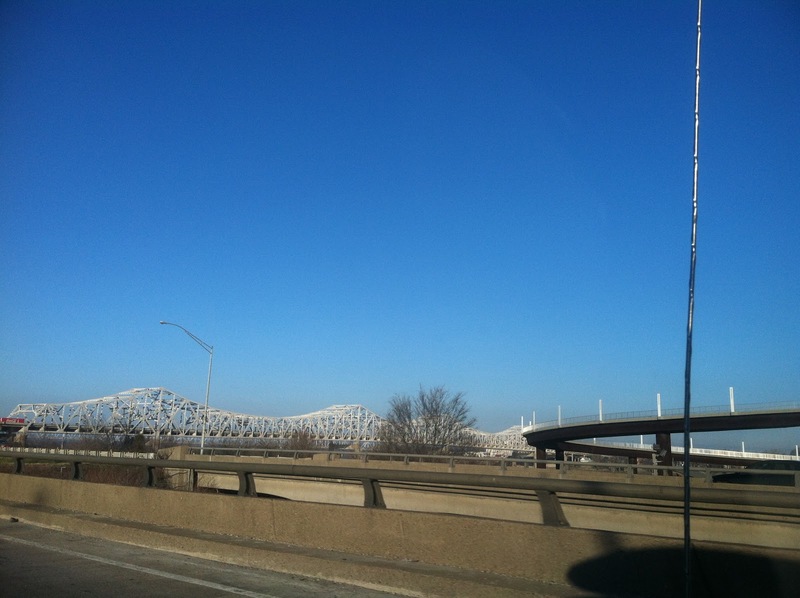 We stayed in a Red Roof Inn in Lexington, Kentucky with our dog, child, presents, and luggage. 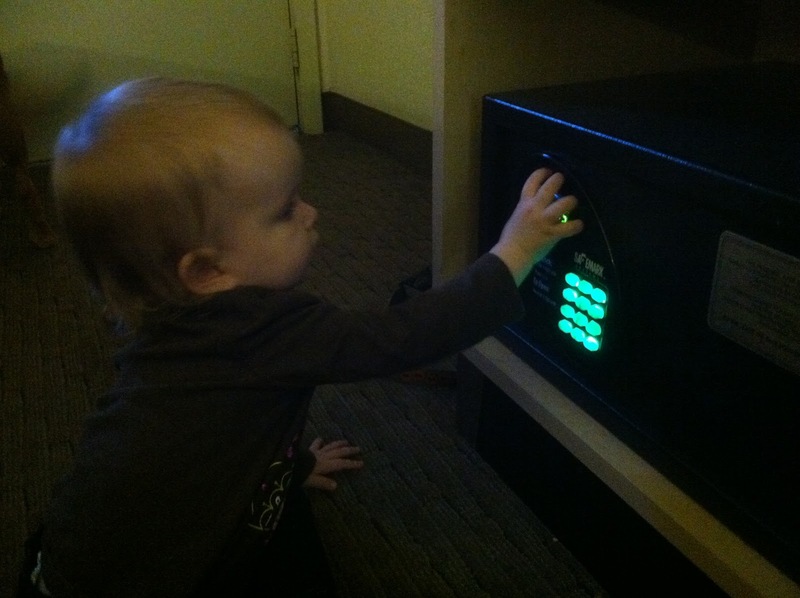 Greta was greatly intrigued by the safe and its light up buttons. We started early the next morning. 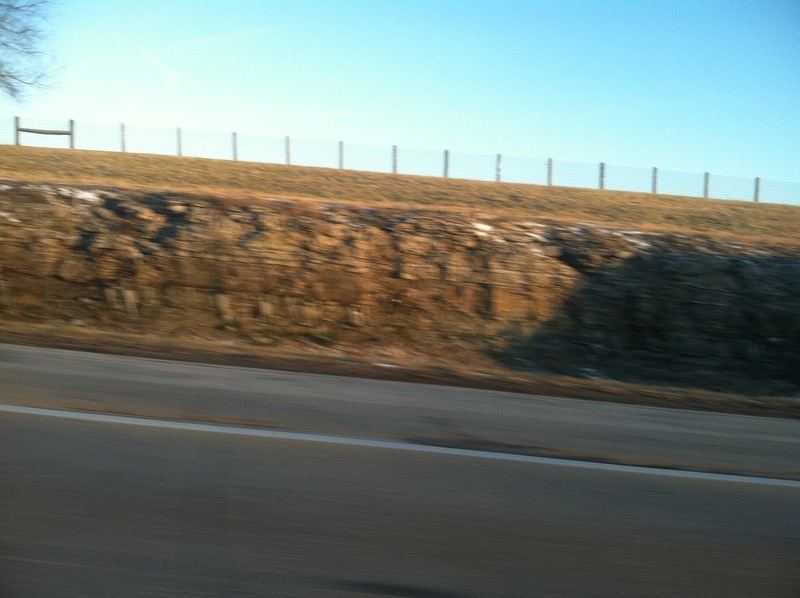 It was much colder than North Carolina and the rocky roadsides in Kentucky were filled with icicles from the frozen underground water oozing out. 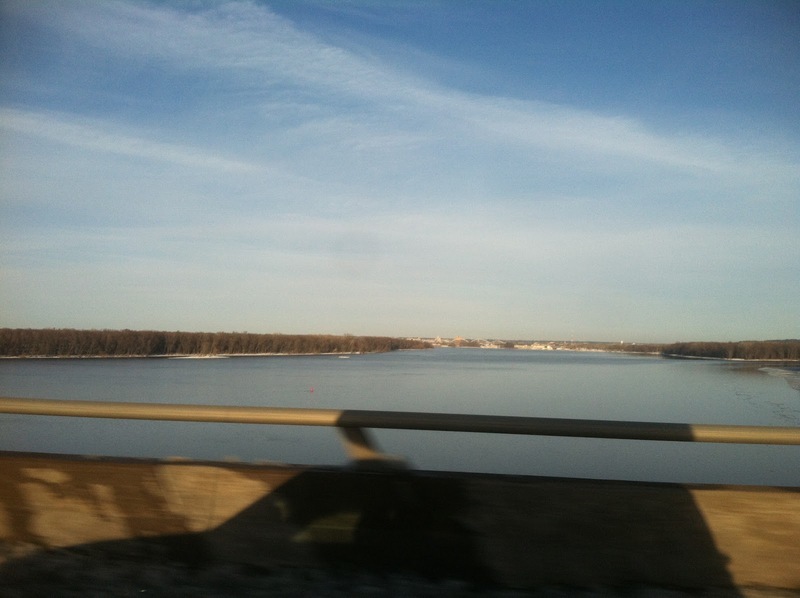 It was a beautiful morning with little traffic. 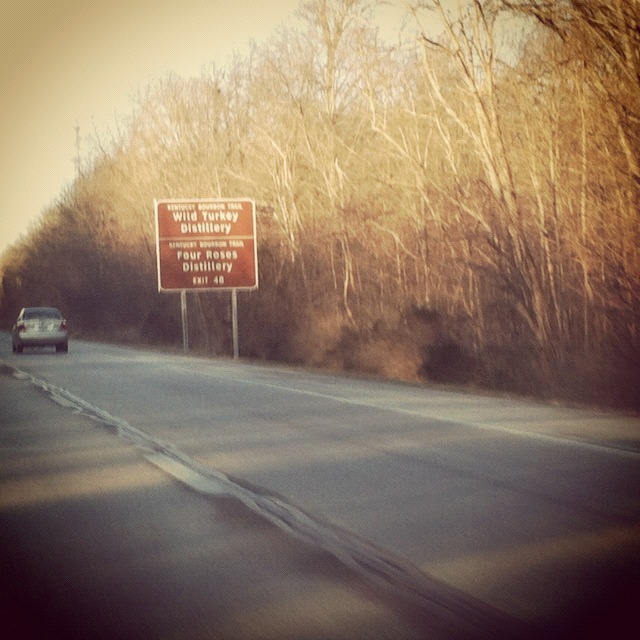 We saw all the signs for the Kentucky Bourbon Trail – maybe another time we will have the time to stop and taste. 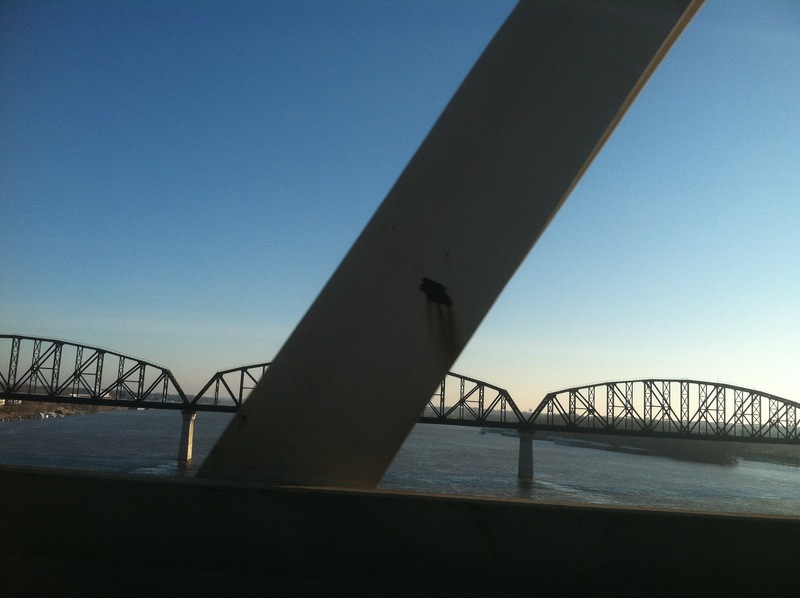 One of my favorite parts of the drive to Iowa would have to be the river crossings. 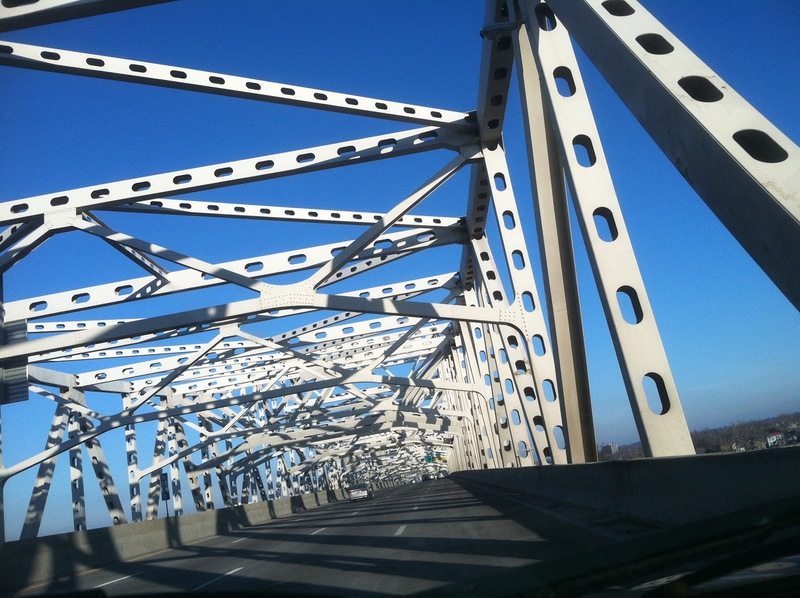 This is the bridge that spans the border to Indiana. 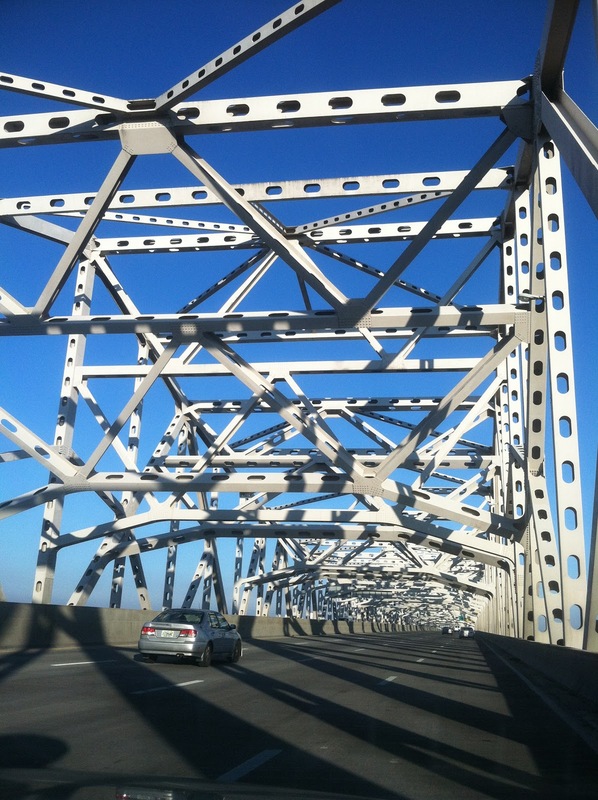 Love the lines on the bridge. 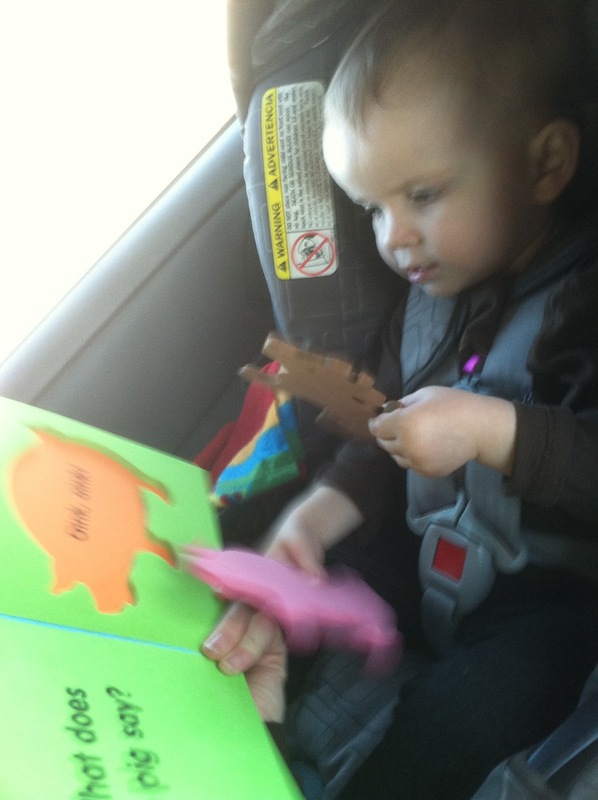 Greta was a trooper and stayed busy between naps with books and toys. 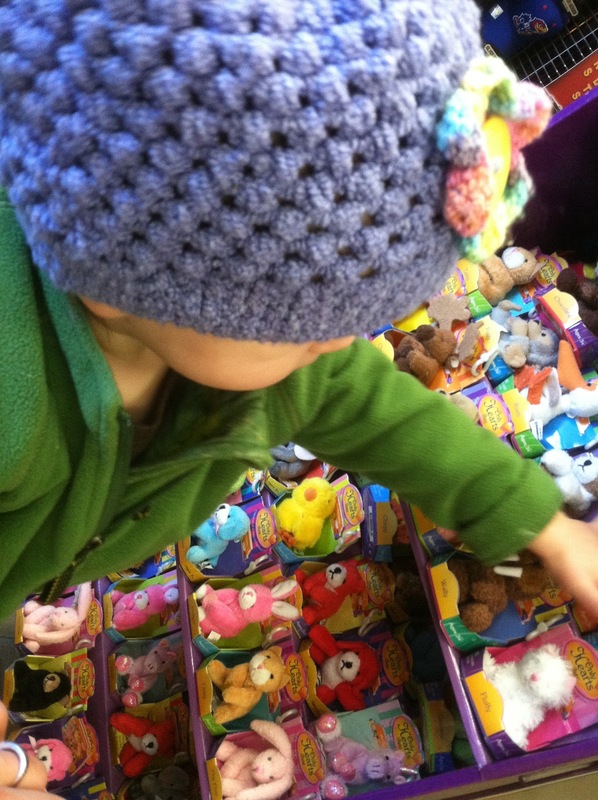 Truck stops are better than toy stores! 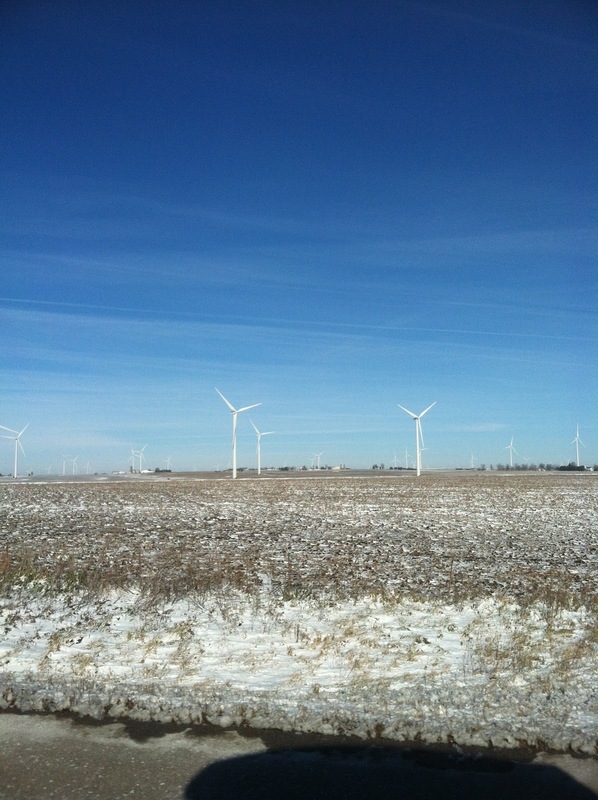 The plains were quickly becoming more and more snowy. 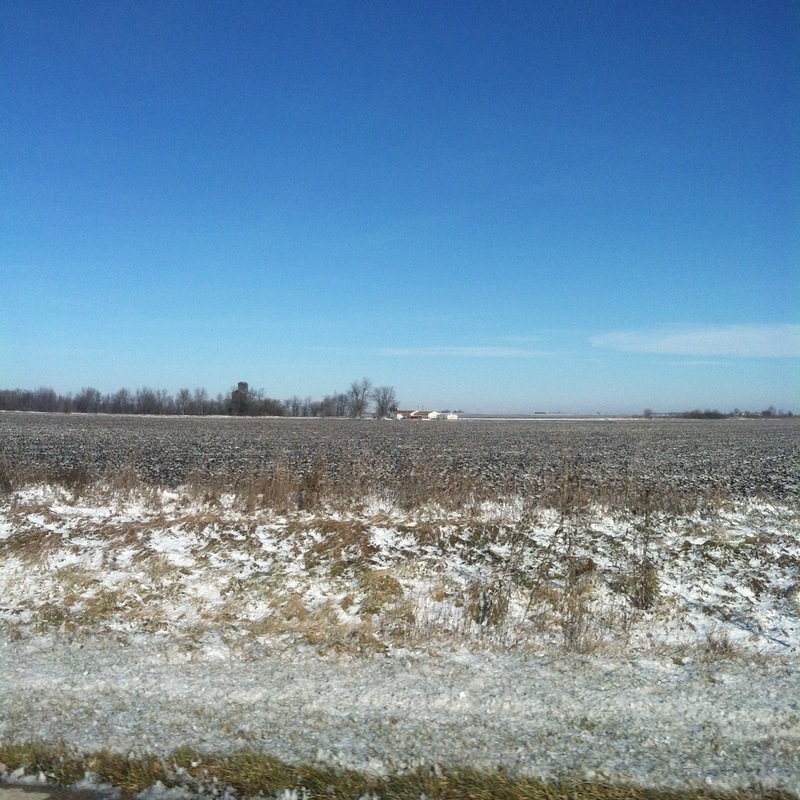 Illinois is a big, flat state. 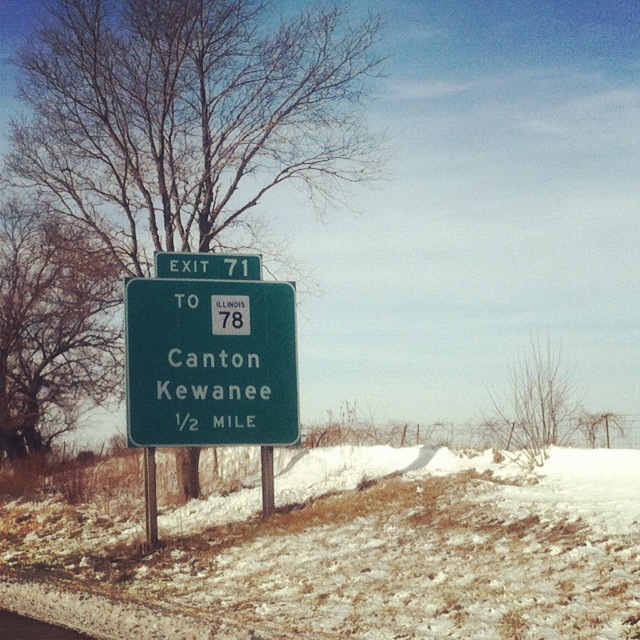 Hi to Kewanee for David! 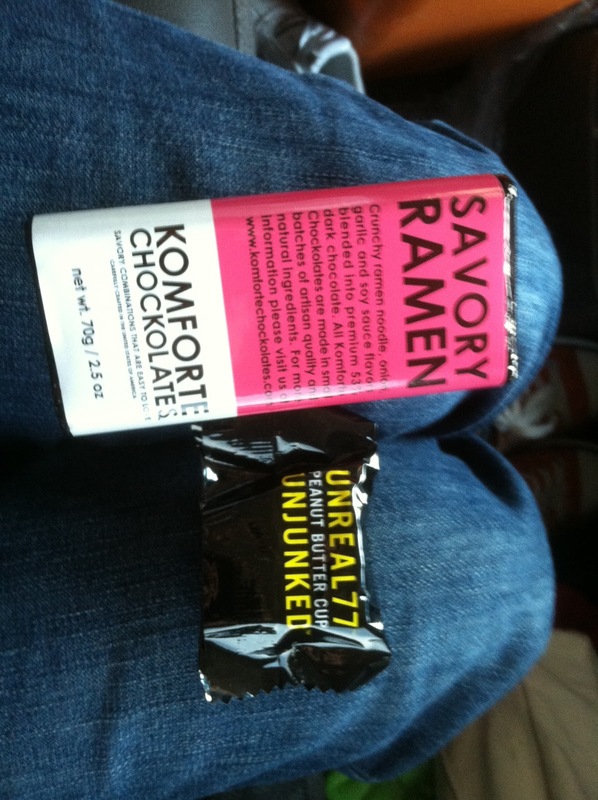 We had really good chocolate snacks to keep us from being too hungry. 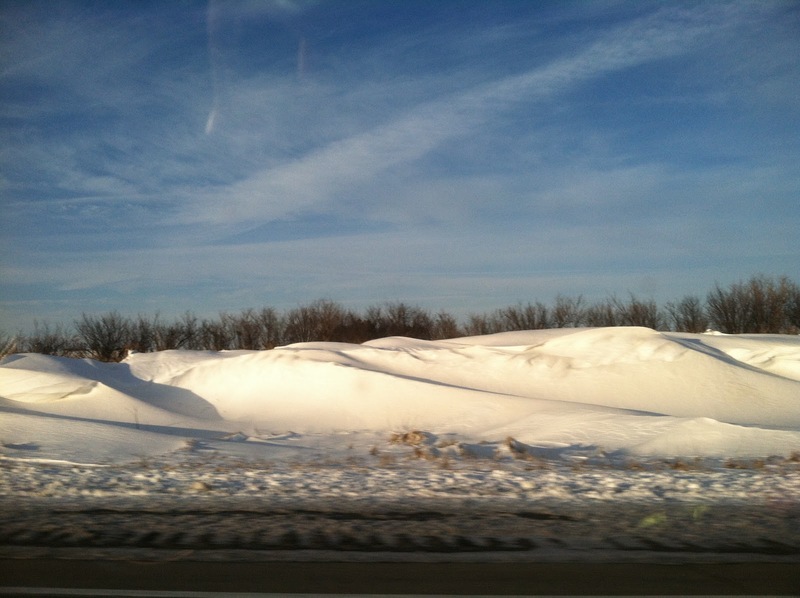 Where it was obvious that Iowa had gotten slammed with snow. 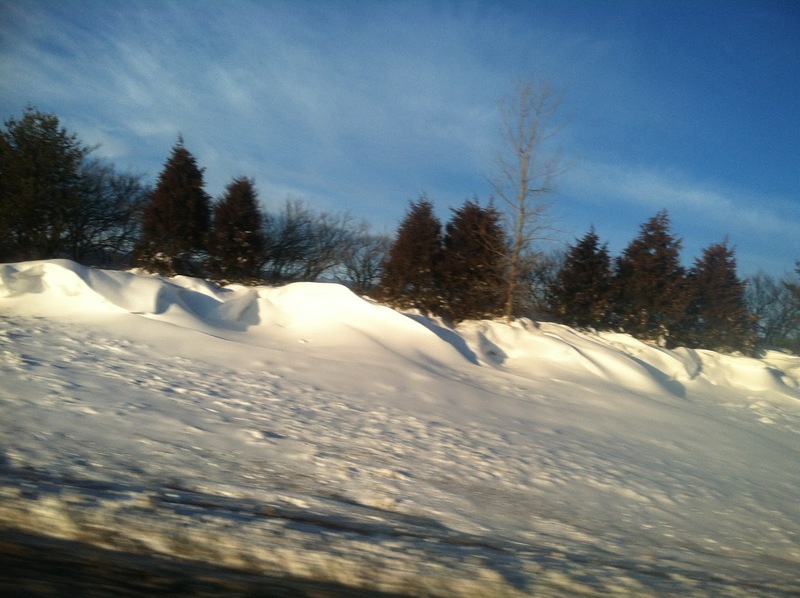 The wind carvings in the snow along I-80 were impressive at times. 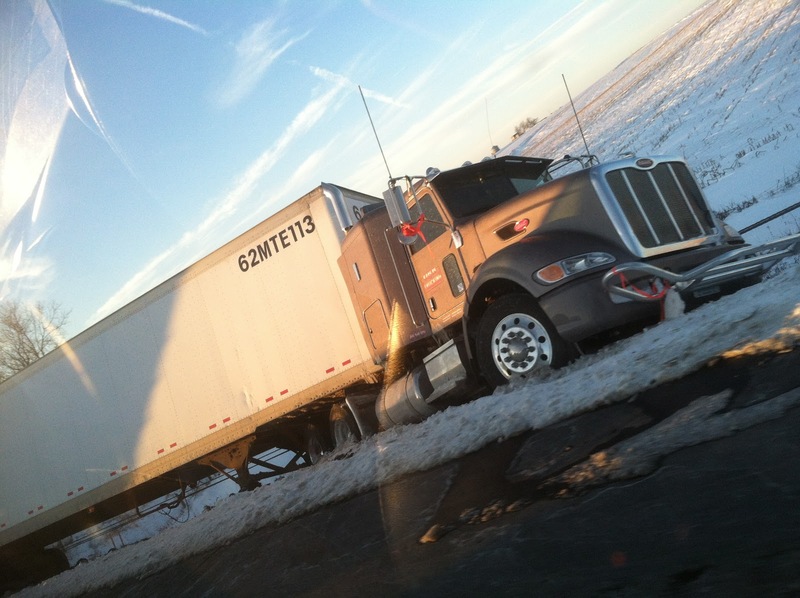 The semis stuck in the snow were a frightening reminder of winter driving. 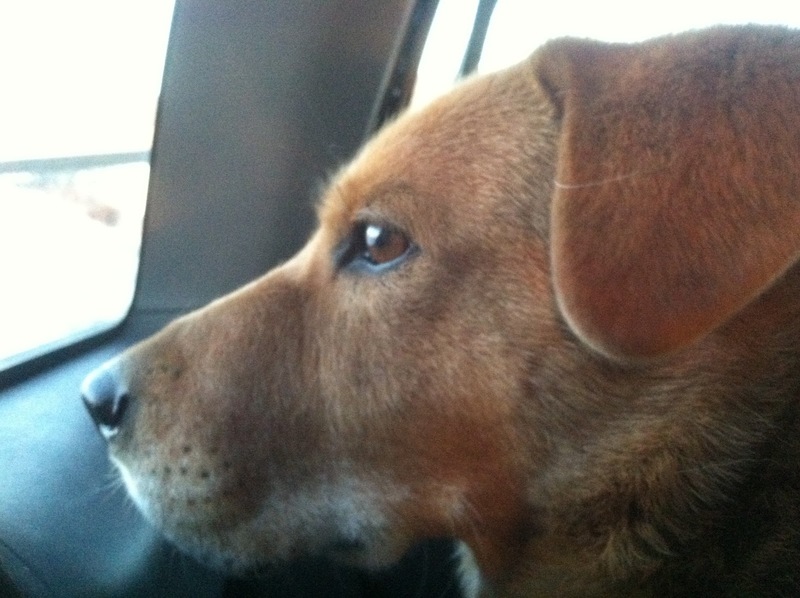 Brownie kept watch on the Iowa countryside during a traffic jam. The hawks were keeping her entertained. 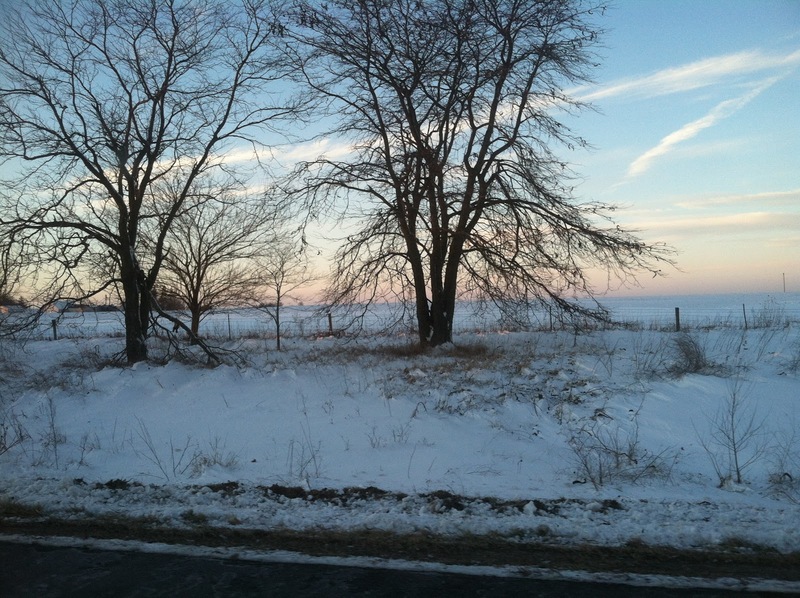 We got in later than we hoped, but got to see a beautiful Iowa winter sunset. Quiche is easily one of the most satisfying and tasty any time of the day meals, if you ask me. Everyone in my family loves it – well except my sister. Poor thing hates eggs and my parents have raised chickens specifically for eggs since we were middle school students. Anyway, I adapted this recipe slightly from a Martha Stewart recipe I had torn out of Everyday Food from 2009. I am absolutely terrible about magazine pages, images, and clippings. Eric hates finding my little magazine nests. I attribute this to my love of making collage art. I started with my vodka and ice water crust, using a half and half ratio of water and vodka. I finally ran out of the Ciroc vodka and have moved on to Belvedere. 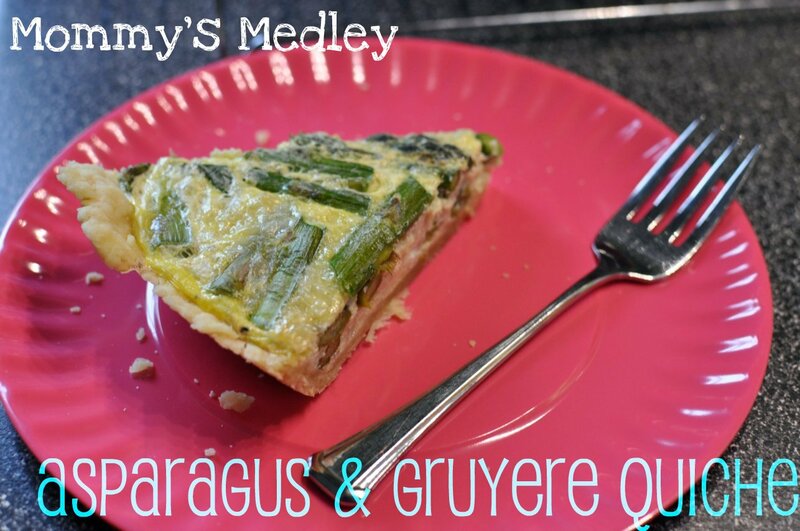 4 ingredients only for this quiche! Prepare the crust using recipe below. Then, add a double layer of foil and dried beans. This will protect the crust from over baking and prevent it from puffing up. Chop 1 bunch of asparagus into sections. Discard lower, white ends. These will be woody, you should be able to feel the difference in texture with your knife. 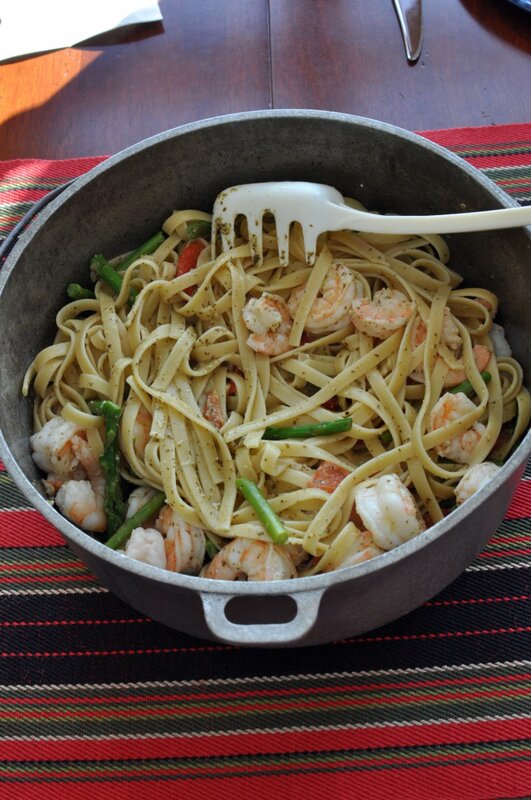 Saute over medium-low heat with 1 tablespoon of olive oil until asparagus is tender. 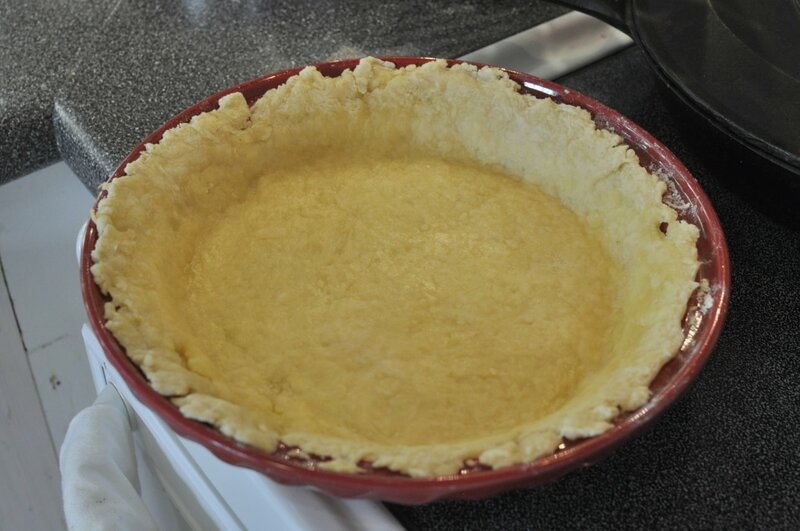 The baked pie crust, golden and ready for the quiche filling. Instead of cream, I opted for coconut creamer. 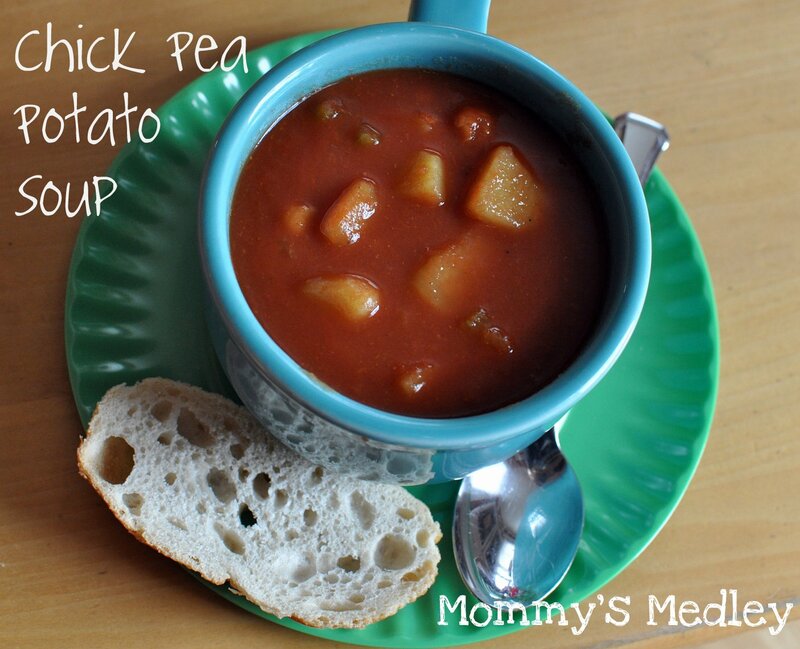 It is an excellent creamy alternative for dairy and does not have the coconut flavor! 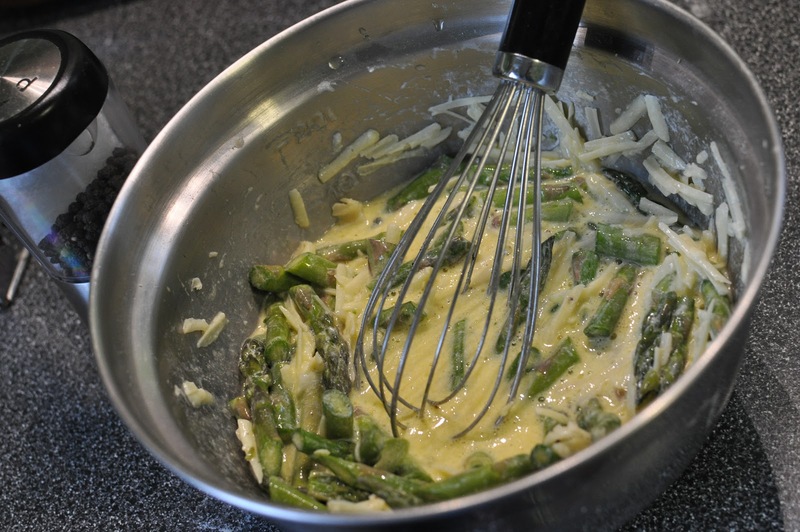 Whisk together 4 eggs, 1 cup coconut creamer, chopped asparagus, and 4 oz of grated Gruyere cheese. Pour filling into prepared and baked crust. 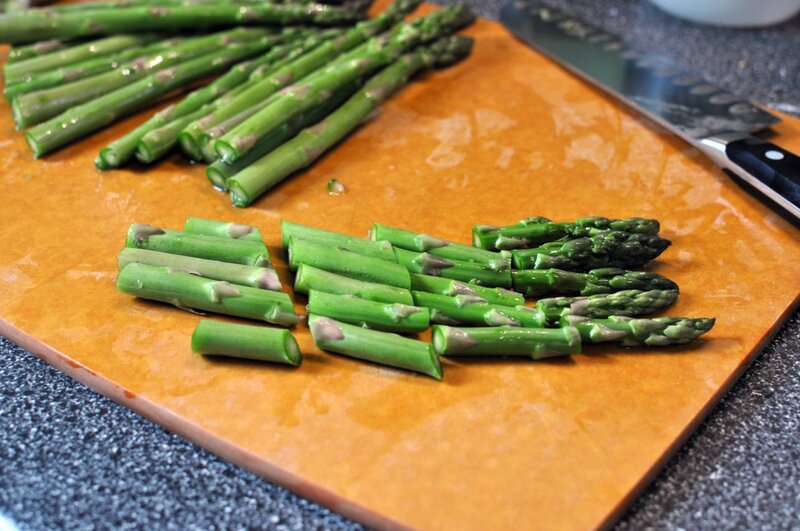 Use a spatula to spread out asparagus evenly. 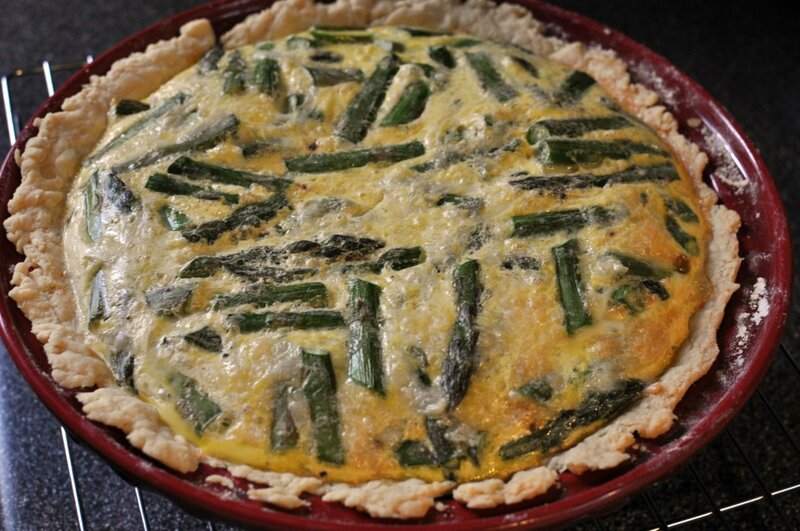 Bake quiche at 325 degrees for 60 to 65 minutes or until a knife inserted in the center comes out clean. The top should be a nice golden color. Allow to cool on rack for 10 minutes. Slice and serve. I actually prefer to make quiche and allow it to cool and then reheat it – I feel that it sets up better this way. 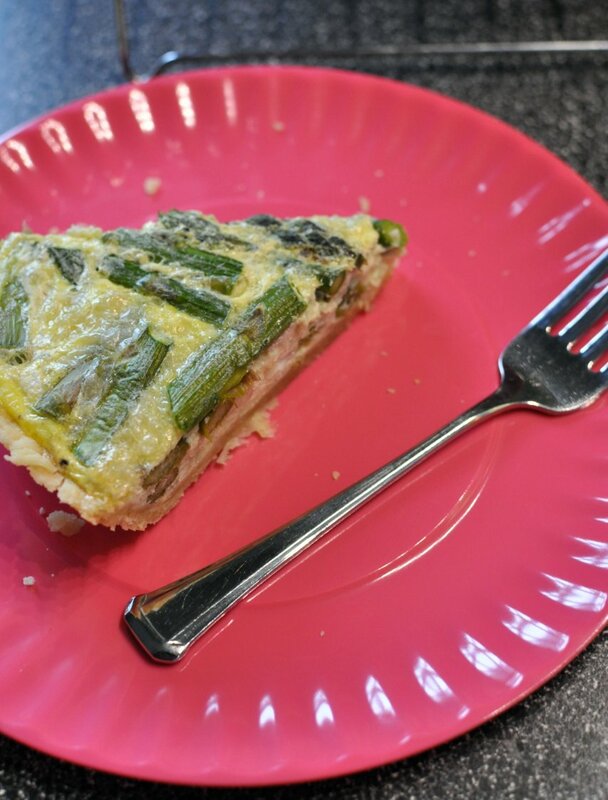 This quiche won’t last long! 1. Cut 1/3 cup butter into 1-1/4 cups flour with a pastry cutter. Pieces should be pea-sized. 2. 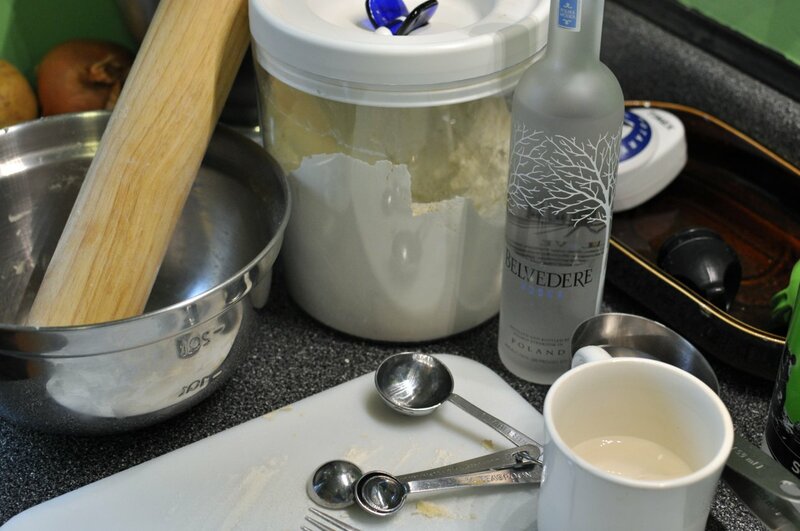 Sprinkle 1 tablespoon cold vodka over part of flour and butter mixture. Toss gently with fork. Push moistened dough to one side of bowl. Repeat using 1 tablespoon at a time (4-5 tablespoons vodka/ice water total) until all flour is moistened. Form into 1 disk. 3. 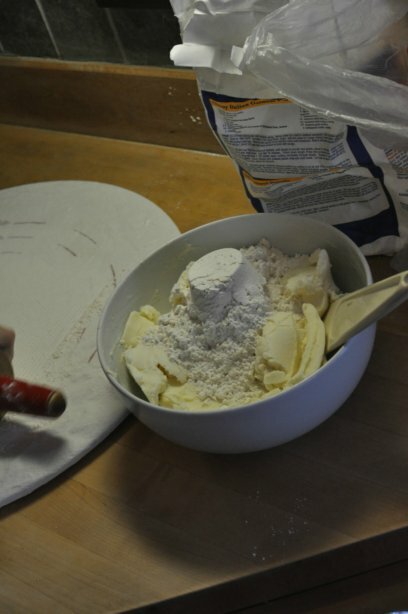 On a lightly floured surface, use hands to slightly flatten dough. Roll into a circle approximately a 12 inches in diameter. 4. 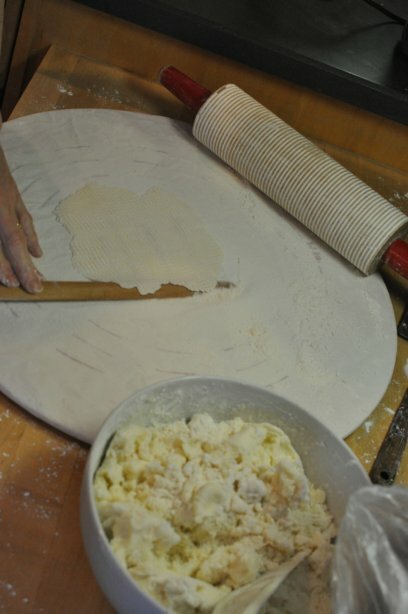 Wrap pastry dough around rolling pin and carefully transfer to pie pan. 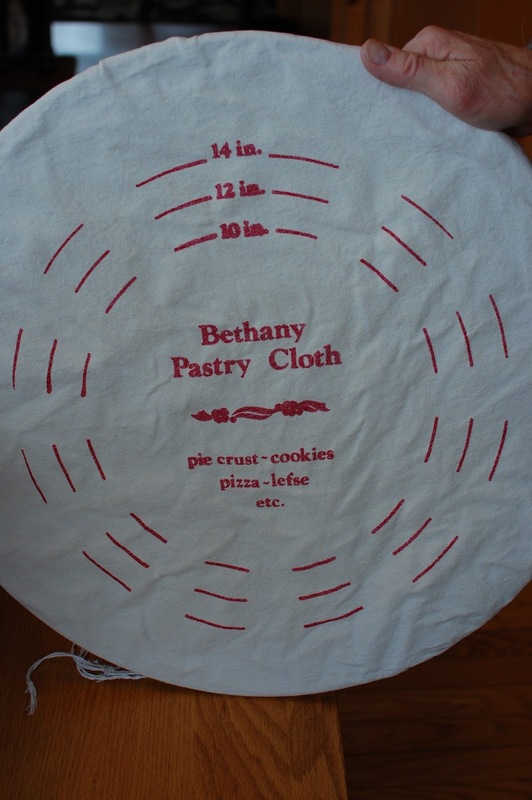 Do not stretch the dough, this will cause shrinking during baking. Trim excess dough off, if needed. 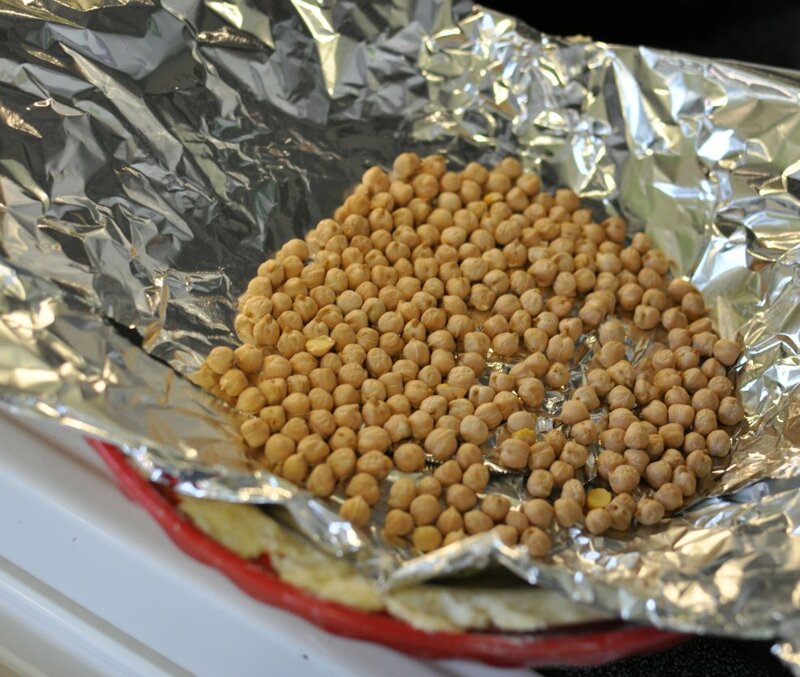 Line with double lining of aluminum foil and fill with baking beans. 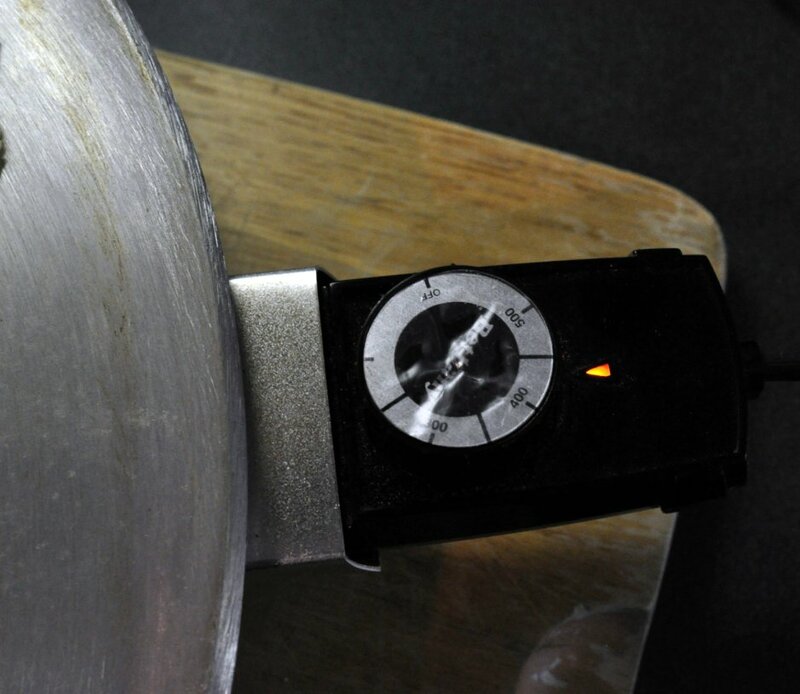 Bake at 450 degrees for 8 minutes. Remove pie crust, remove foil set aside. 1. Chop 1 bunch of asparagus into sections. Discard lower, white ends. These will be woody, you should be able to feel the difference in texture with your knife. Saute over medium-low heat with 1 tablespoon of olive oil until asparagus is tender. 2. 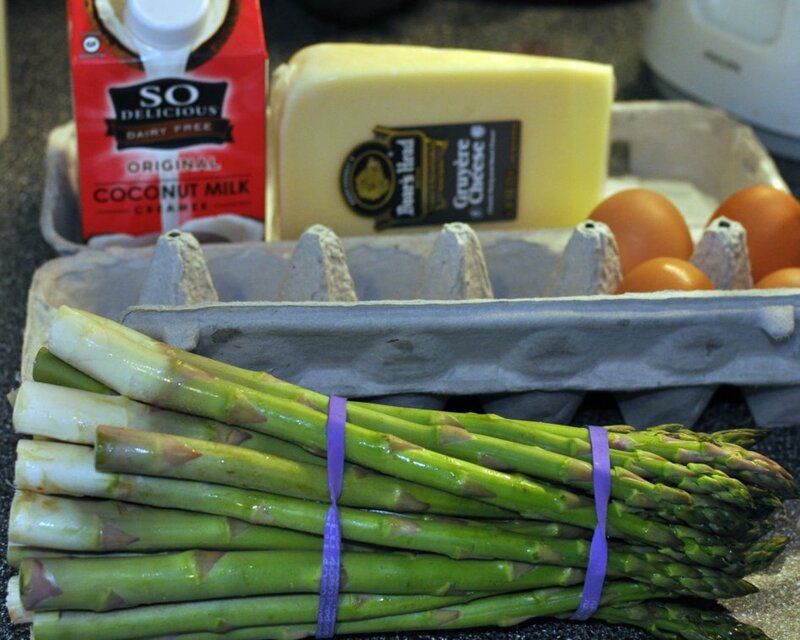 Whisk together 4 eggs, 1 cup coconut creamer, 1 bunch chopped &sauteed asparagus, and 4 oz of grated Gruyere cheese. Pour filling into prepared and baked crust. 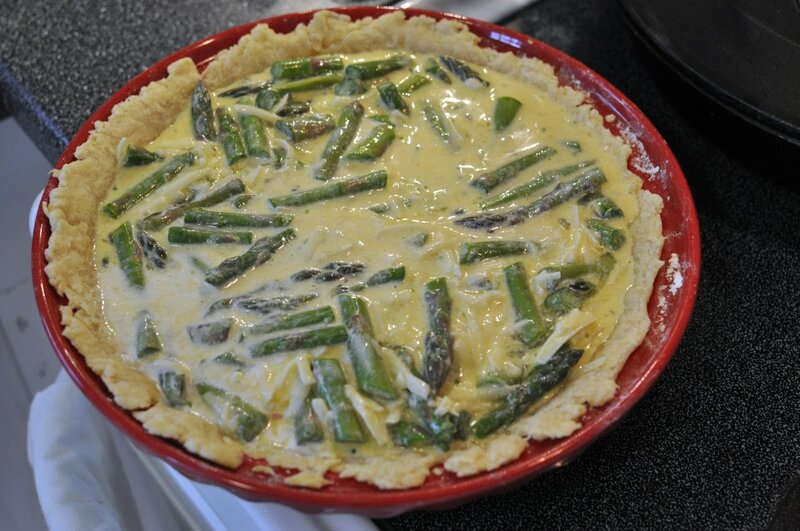 Use a spatula to spread out asparagus evenly. 3. 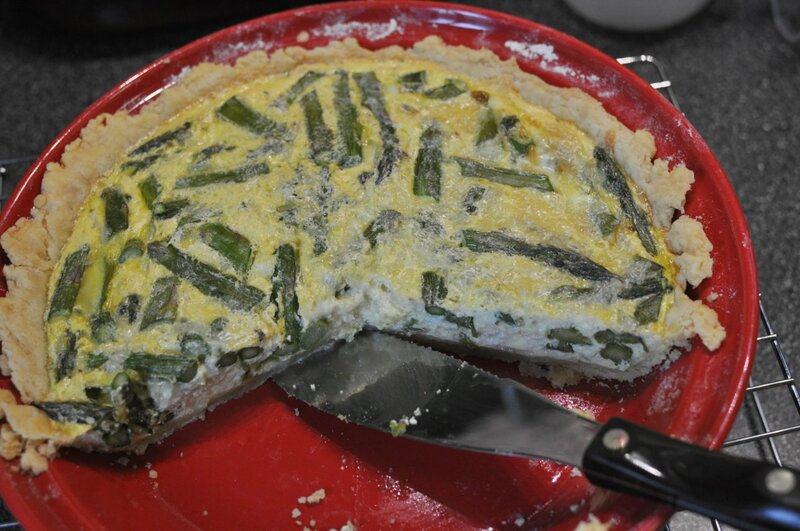 Bake quiche at 325 degrees for 60 to 65 minutes or until a knife inserted in the center comes out clean. Allow to cool on rack for 10 minutes. 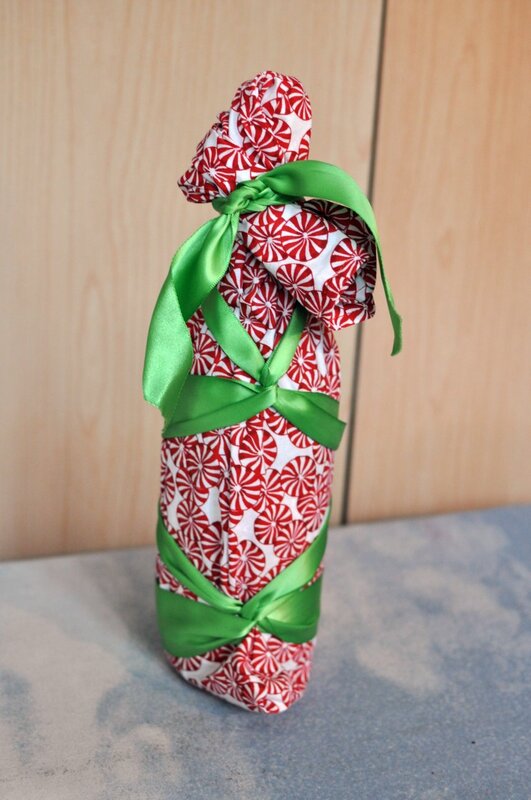 I whipped up a couple of these to wrap some of my home made gifts in this year. 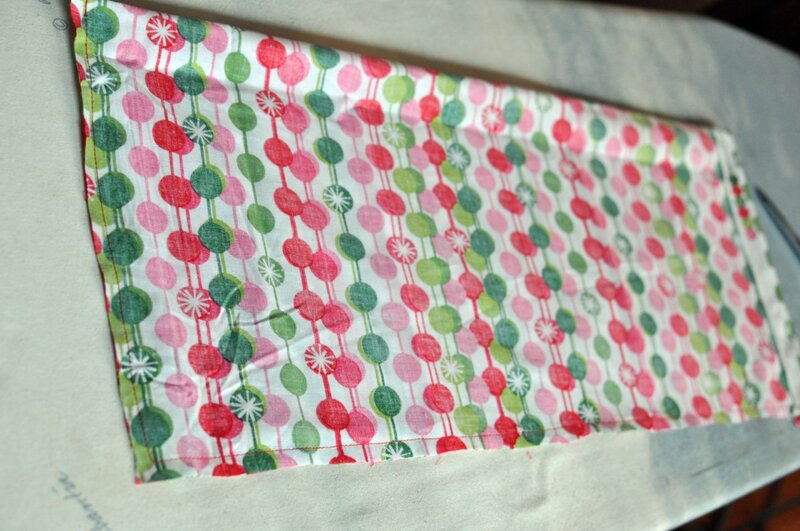 I have a bunch of holiday fabric leftover from the advent calendar project and so am using it up little by little. I will do my best attempt at explaining this project, but will admit readily that I am far better at explaining art steps than sewing steps. Please forgive me in advance for lack of technical terms and some sloppy work. Step 1: Measure fabric twice. Cut once. I laid the actual gift on top to be sure it would fit. I am well known for cutting too hastily. Step 2: Press and sew the edge that will be the opening for the drawstring closure. I, of course forgot to do this step and so had to go back and rip out seams and re-sew. I know, I know, if something is worth doing, it is worth doing badly. Step 3: Turn fabric right side down. Press and pin a section along the top side of the fabric. This will be the space for your draw string to go. 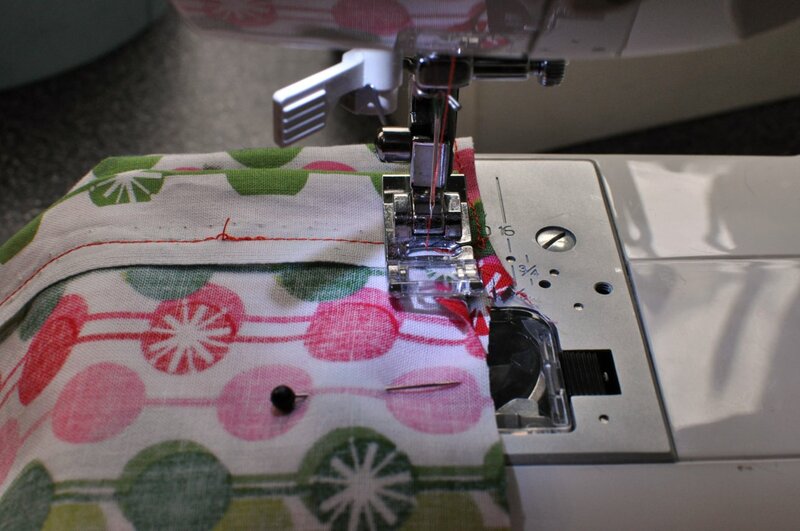 Step 4: Sew a seam along the edge of the folded fabric. See image above. Step 5: Fold fabric together, wrong sides in. 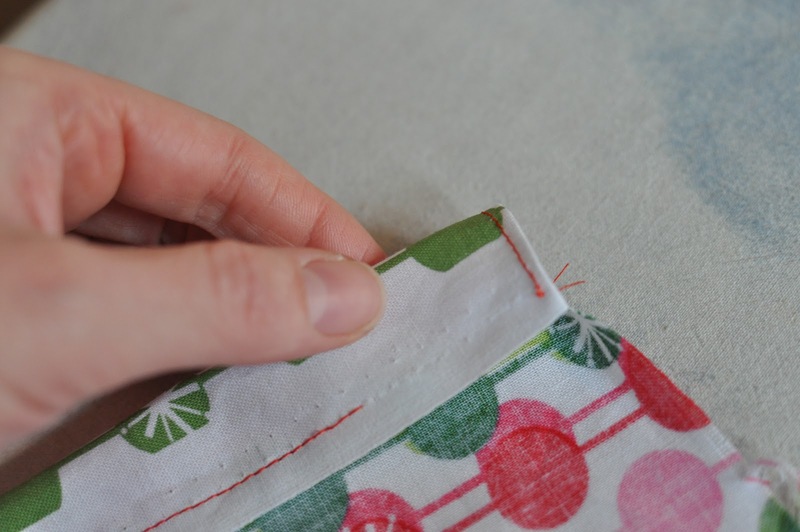 Pin on two sides – the long side and short side opposite the top folded seam you just sewed. 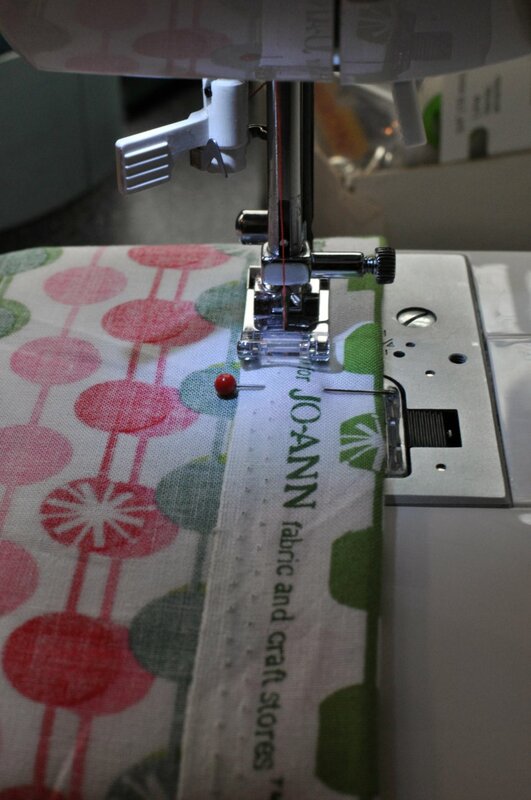 Sew a seam using 3/8″, or so. 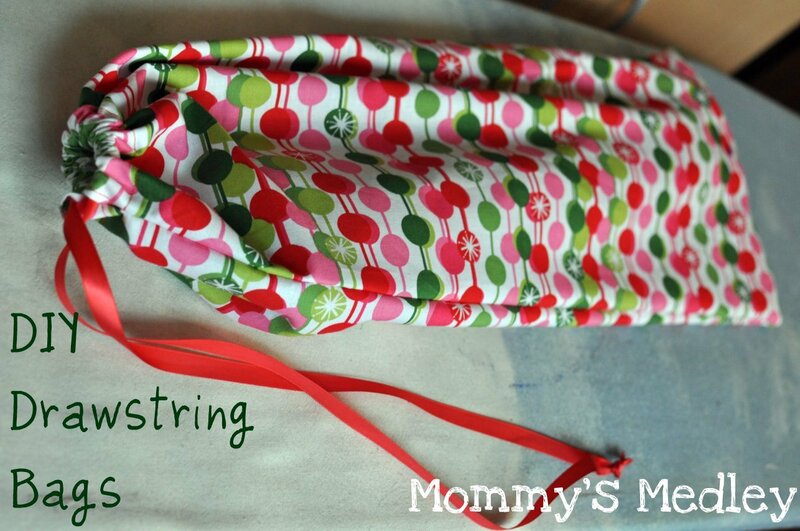 Start your seam just below the seam for the drawstring. See image above for starting point. 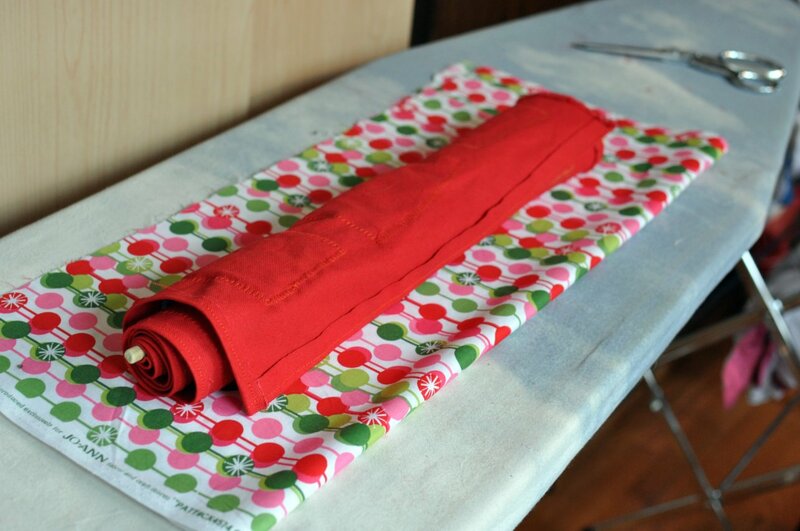 Step 5: The fabric will now be sewn into a bag. Turn bag right side in. 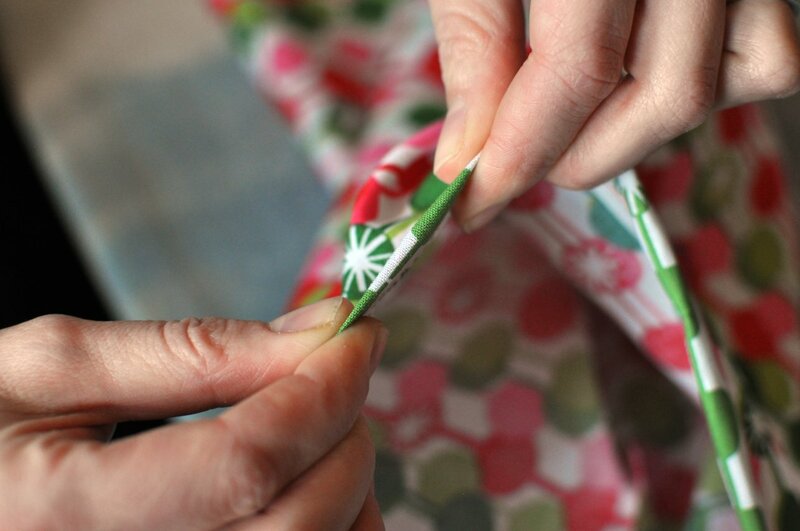 Cut a length of ribbon a little more than twice as long as the top edge of the bag. Pin safety pin on one edge. See image above. 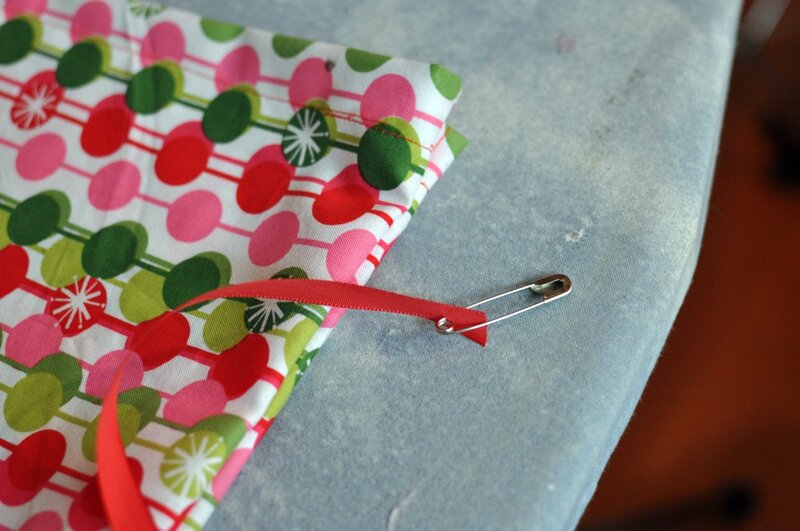 Step 6: Thread safety pinned ribbon into one opening at the top of the bag. Thread all the way through using motions shown below. Undo safety pin. 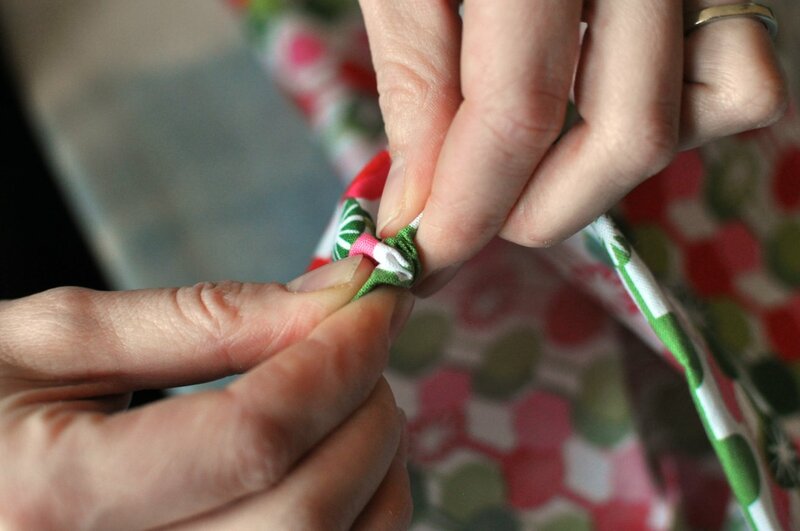 Tie two ribbon lengths together to prevent ribbon from escaping. 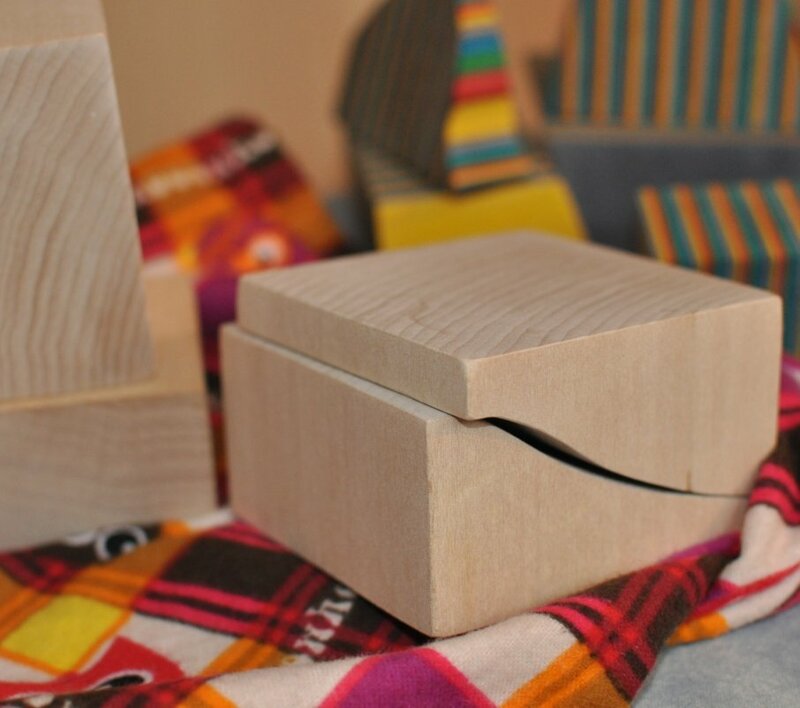 I even made one for Greta’s gift of homemade wooden blocks. 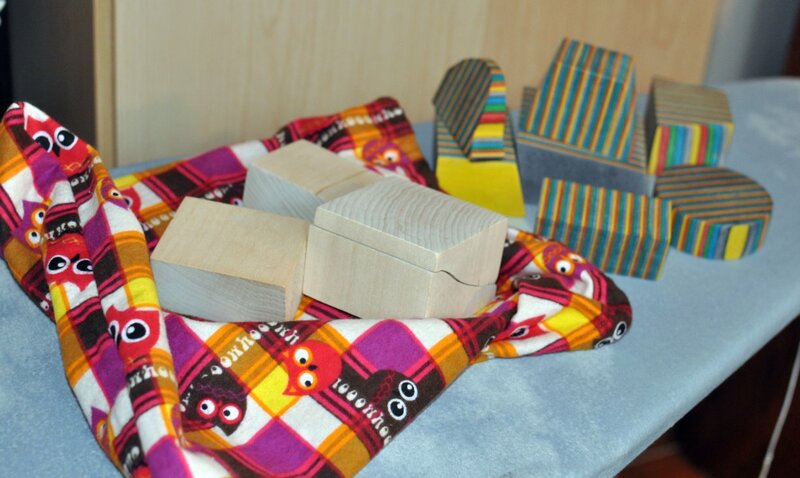 Eric made her a beautiful set of wooden blocks from striped and a plain light-colored wood. She will love these. I am so excited for her to open her gifts this year. I made this soup on Friday to bring to a work gathering – I love it because it is simple, hearty, and easy to make. I ended up adding quite a bit of curry to the leftovers, after the party. This recipe makes a very large batch, so if you want less, cut this recipe in half. 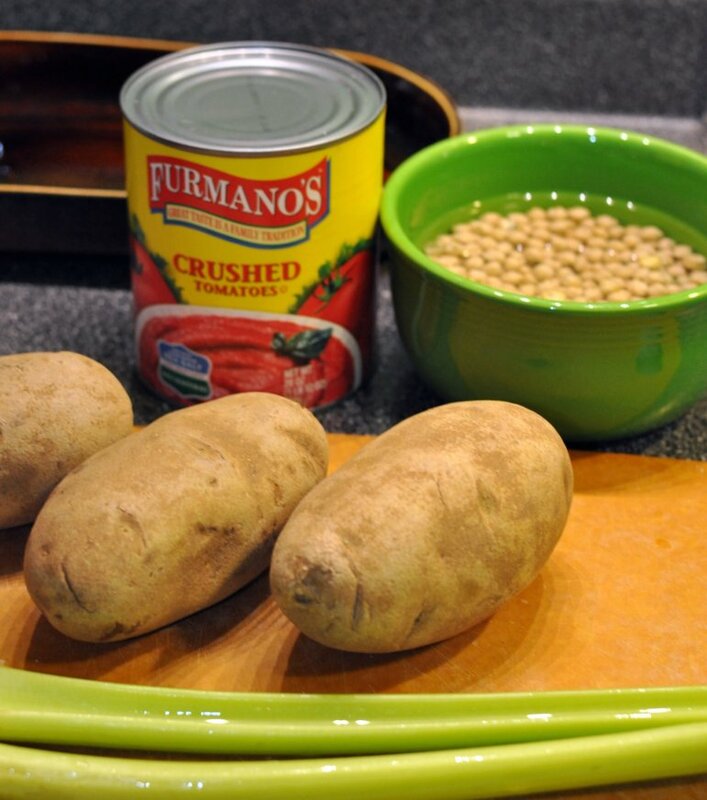 Combine in a slow cooker: 4 stalks of diced celery; 3 large potatoes, peeled and cubed; 1-1/2 cups chick peas (canned or soaked overnight); 1-28 oz can of crushed tomatoes, and 28 oz of water. 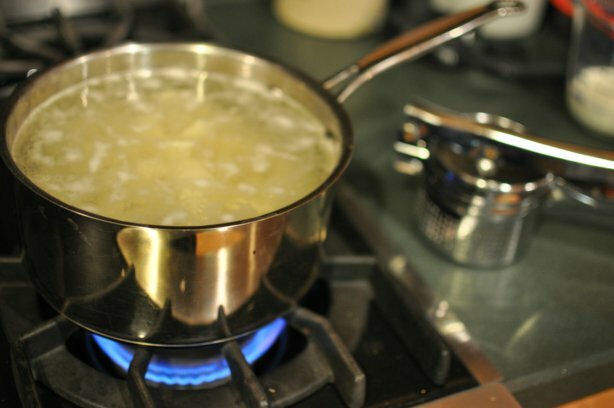 Stir well, add more water, if it is needed to cover all the vegetables. 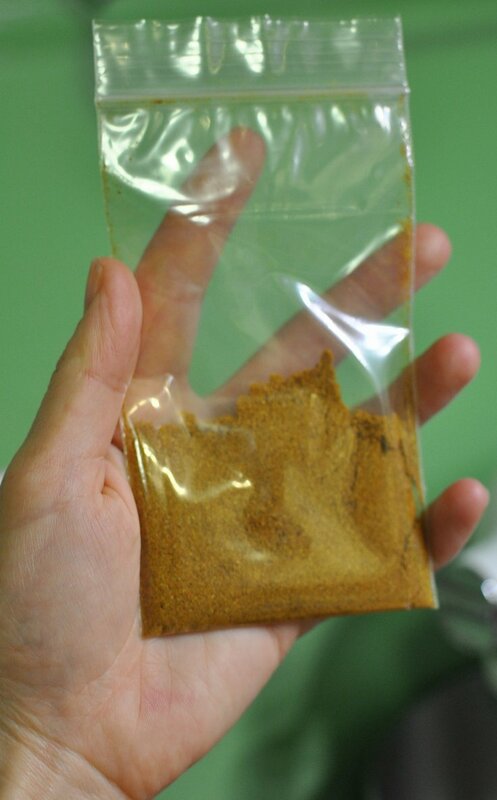 Add 1 packet of Sukhi’s Gobi Aloo Complete Spice Mix. Actually, I think a second packet would have made this taste even better. 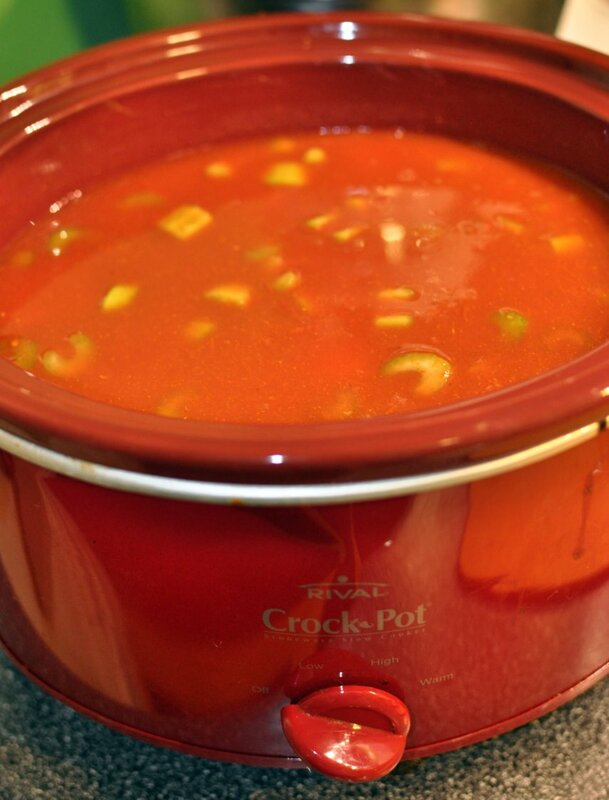 I love how thick this soup is – the crushed tomatoes worked perfectly. On a side note: Greta saw her breath for the first time this year. 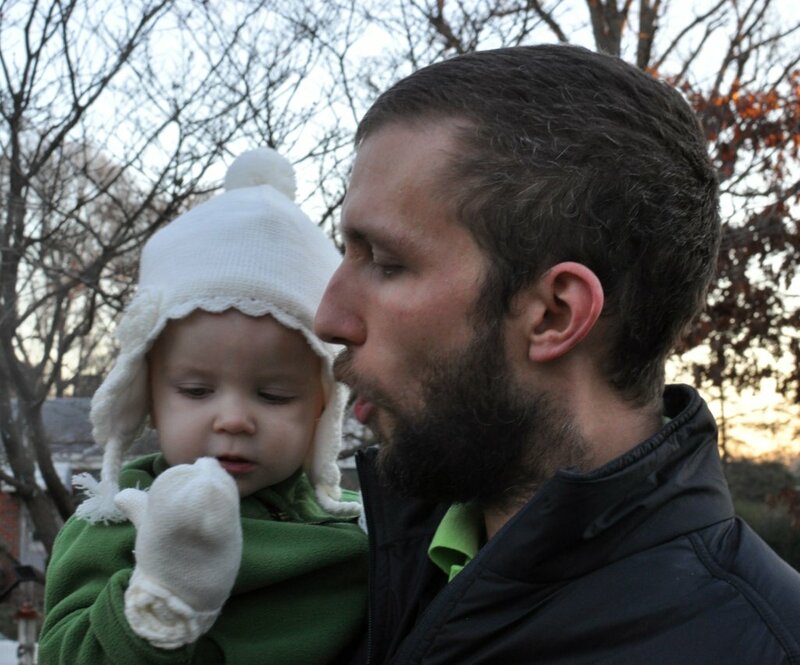 She was amazed at the small clouds she and Eric were able to make. It was so cute to watch her try and catch the clouds of her and Eric’s breath. She smiled and smiled. Luckily, I just happened to have my camera ready on the way to work and was able to snap a couple of these photos. 1. 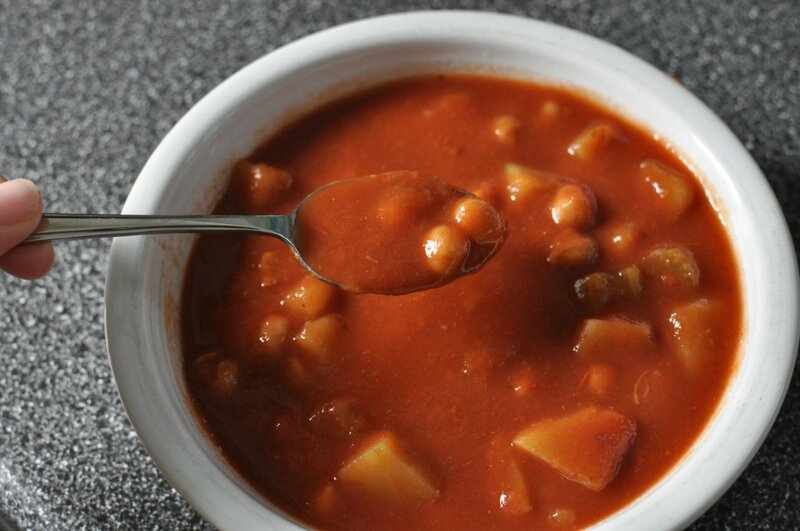 Combine in a slow cooker: 4 stalks of diced celery; 3 large potatoes, peeled and cubed; 1-1/2 cups chick peas (canned or soaked overnight); 1-28 oz can of crushed tomatoes, and 28 oz of water. Stir well, add more water, if it is needed to cover all the vegetables. 2. 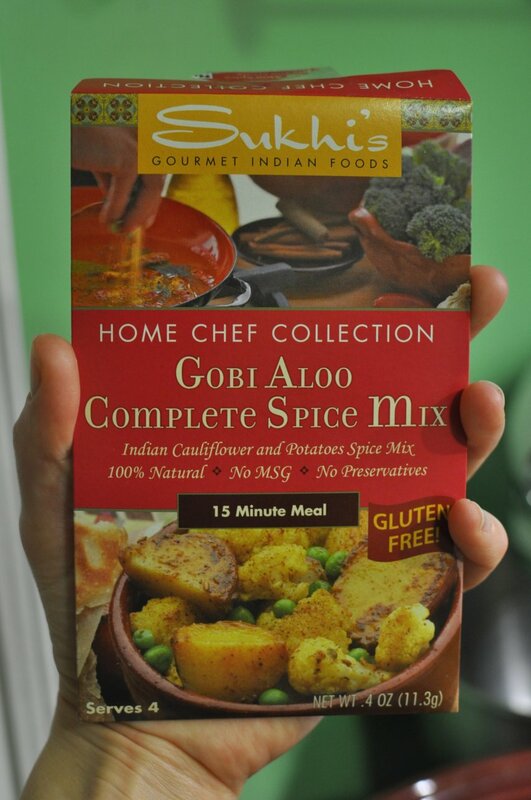 Add 1 packet of Sukhi’s Gobi Aloo Complete Spice Mix. 3. Cover and cook on low for 7 – 8 hours. 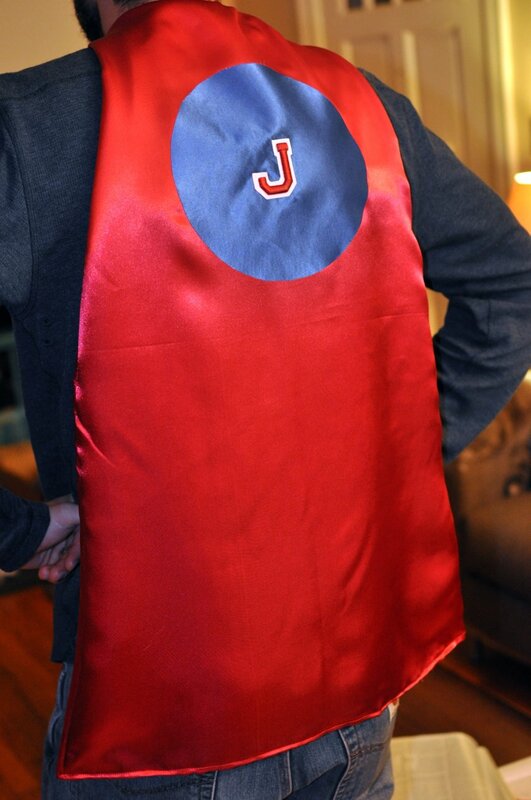 I found this tutorial online on how to make a super hero cape for kids and decided to give a go. There are two little boys who (hopefully) will love these. 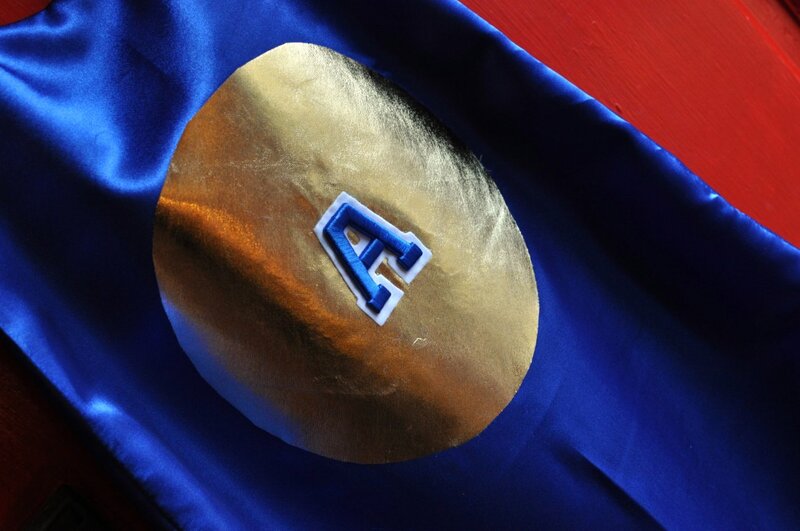 I opted for a synthetic satin fabric with accents made from iron on letters and circles of contrasting fabric. The slippery fabric gave me flashbacks to sewing a prom dress and so I may leave this fabric alone for a while after this project. I need to forget how fussy it can be. 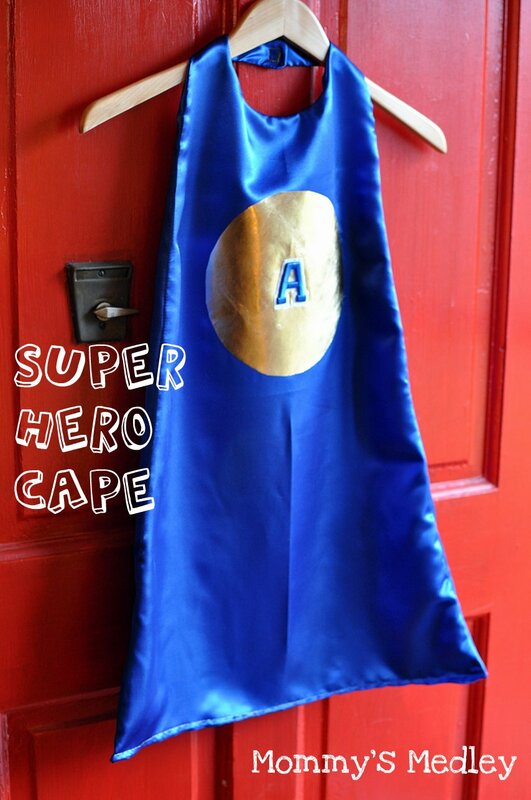 The iron on letters work great – just be sure to iron them on before you pin, sew or assemble the cape in any way. I cut out both sections of the cape, and then attached the circles with iron on transfer paper, then pinned, and then sewed. This cut down on messy sewn hems with slippery icky fabric. Can you tell I am not a fan of this fabric? 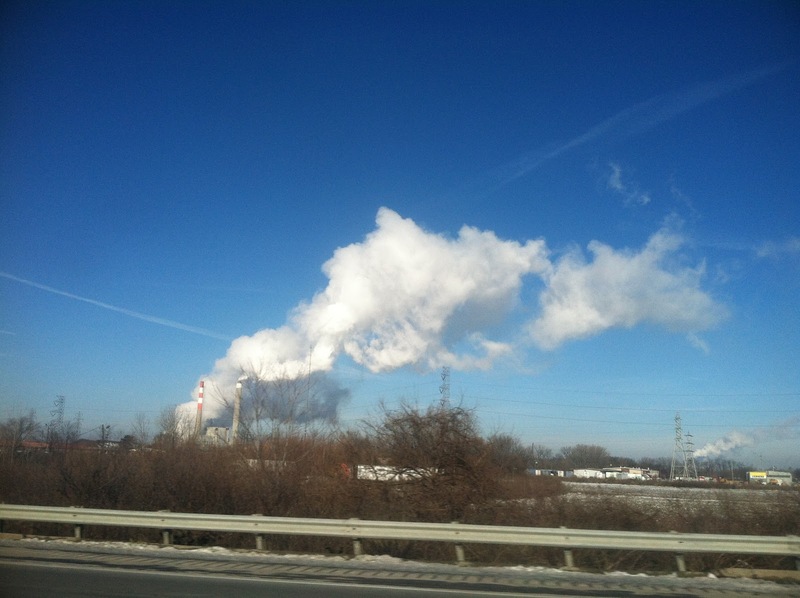 Give me felted wool or cotton any day! I was surprised at how easy this pattern was and how well it fits all sizes – little boys to adults. My general rule is, if you are making one, why not make 2? However, in reality I made 3, the first one I made was so mucked up it is just sitting in the craft room wait now, awaiting its fate. Maybe I will feel bold and find a way to re purpose it for Greta. The sweet gum tree can be a thorn in the side of any homeowner. They are a mess and quite difficult to clean up – clogging many a leaf blower. However, they are a crafter’s delight. I first encountered these seed pods when I was in kindergarten in New York. My teacher brought a bag of them into class and had us glue toothpicks into the holes. We then spray painted them gold and gave them to our mothers as Christmas ornaments. 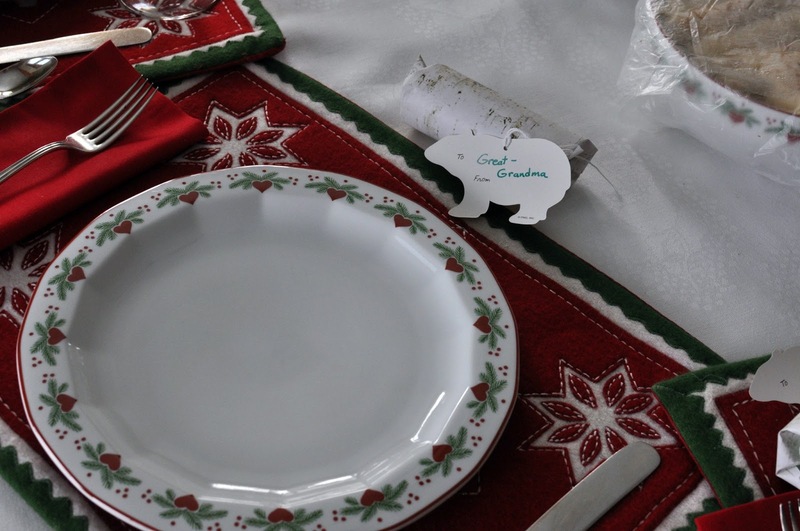 My mother still gets hers out every year and they grace a table or buffet top. This wreath stems from that very project. 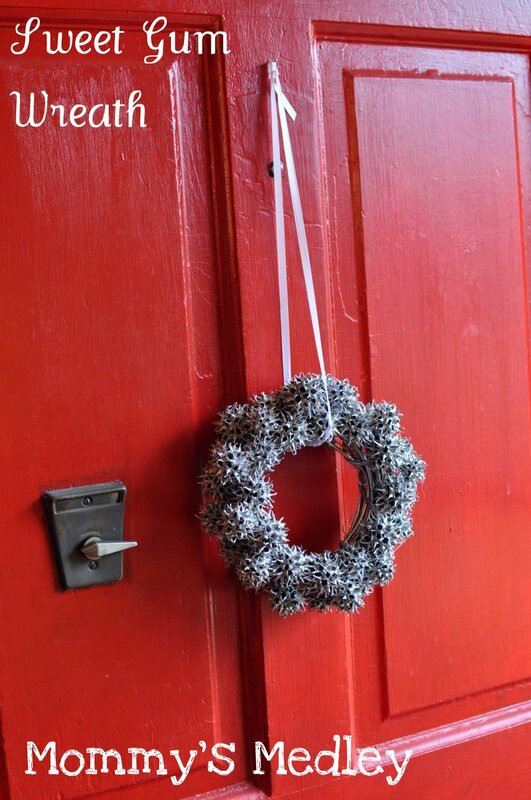 When I moved from the Midwest to North Carolina I found these gumballs all over my neighborhood and I quickly put them to use for a pretty wreath for my front door. 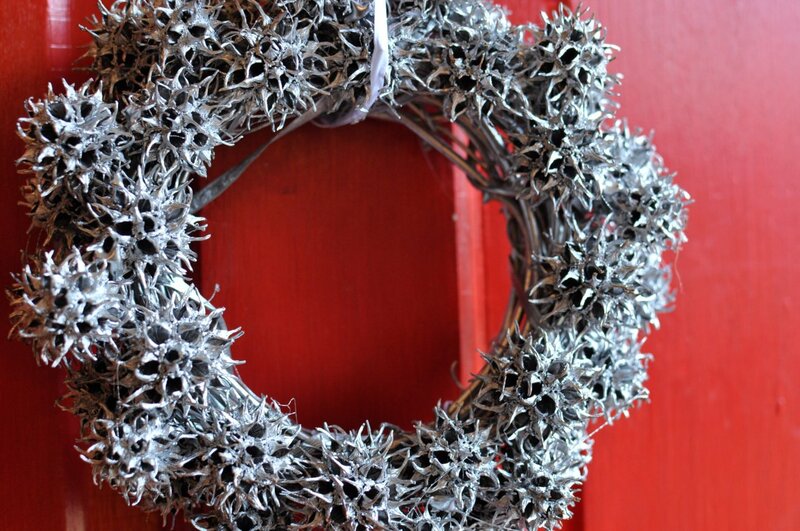 Simply hot glue gumballs onto a wreath form. Spray paint silver, gold, or any other desired color. Hang with a ribbon. 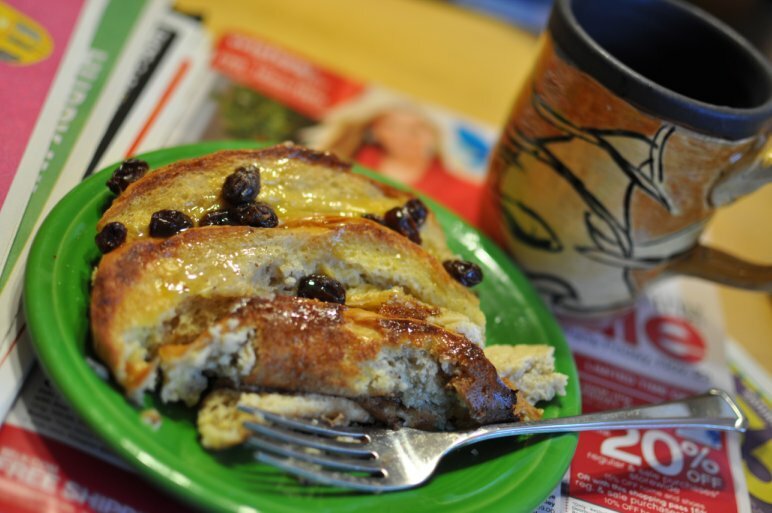 I have the perfect holiday or Sunday brunch item for you – Egg Nog French Toast Casserole. This is what my family was eating Thanksgiving morning with out ginormous newspaper stuffed full of ads. Normally I would not touch egg nog with a 10 foot stick, I hate the stuff, but for some reason this recipe was fine by me. 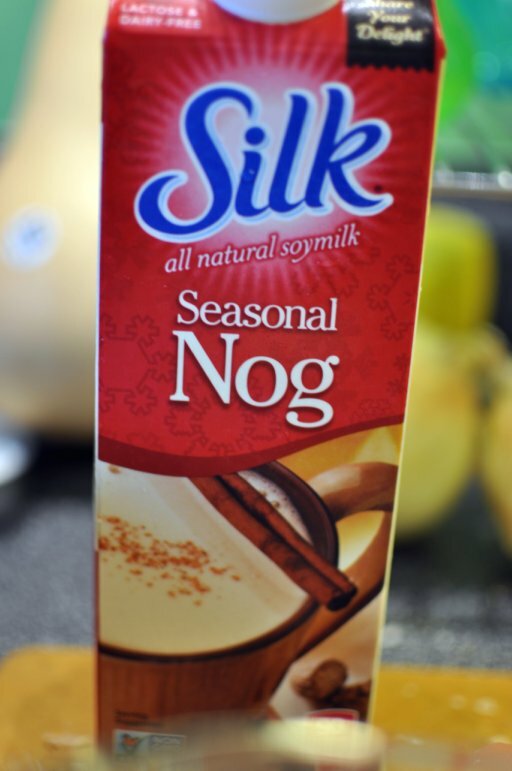 I used Silk nog and almond milk, so it was dairy free for our family, but you could easily swap in the real stuff. 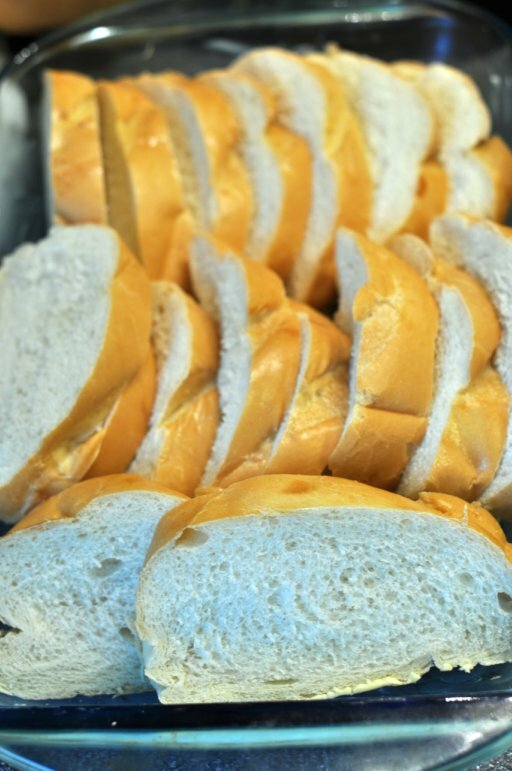 First, slice one loaf of Italian bread into about 18 – 20 equally sized slices. Stale bread always works best. Otherwise, you can slice your bread and let it sit in a warm oven for 10 minutes. 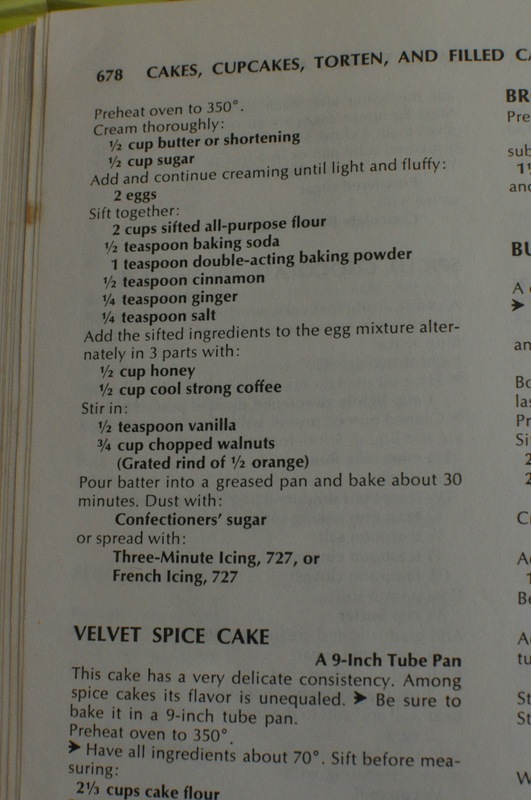 Arrange them into a 9 x 13 inch baking dish greased with margarine. whisk together with 1 cup milk, 1 tablespoon agave syrup (or 2 tablespoons sugar), 1 teaspoon vanilla, 1/2 teaspoon cinnamon, 1/4 teaspoon nutmeg, and 8 eggs. 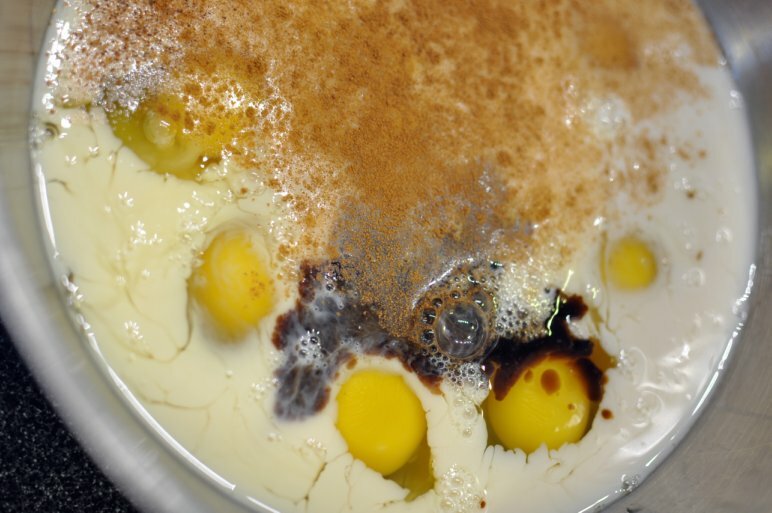 Pour the egg mixture over the arranged bread. Sprinkle 1 cup raisins over the top. Use a spatula to press bread slices and spread around egg mixture, ensuring that all bread is coated in egg mixture. Cover and refrigerate overnight. Uncover and bake at 350 degrees for 1 hour. Serve with warm with maple syrup. 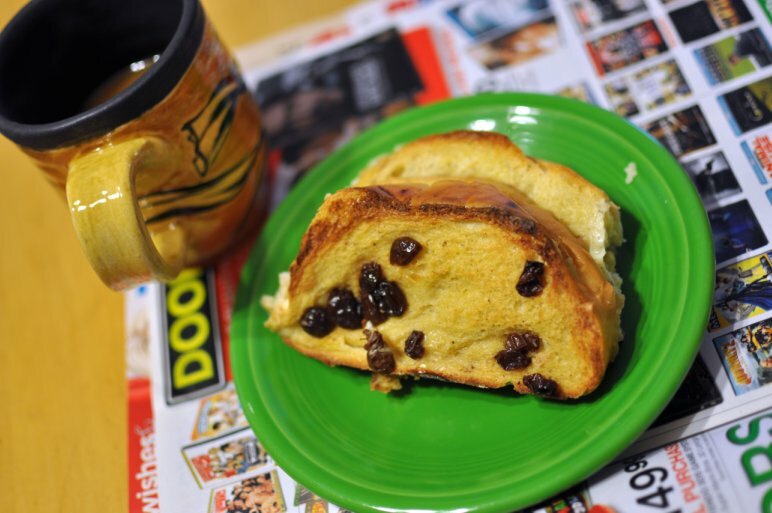 This may become the only way you prepare French Toast – it’s just too easy! 1. 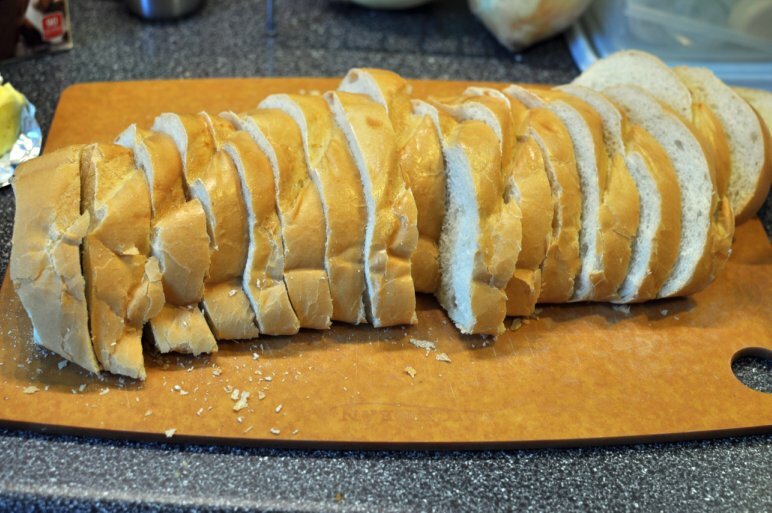 Slice one loaf of Italian bread into about 18 – 20 equally sized slices. Arrange them into a 9 x 13 inch baking dish greased with margarine. 2. 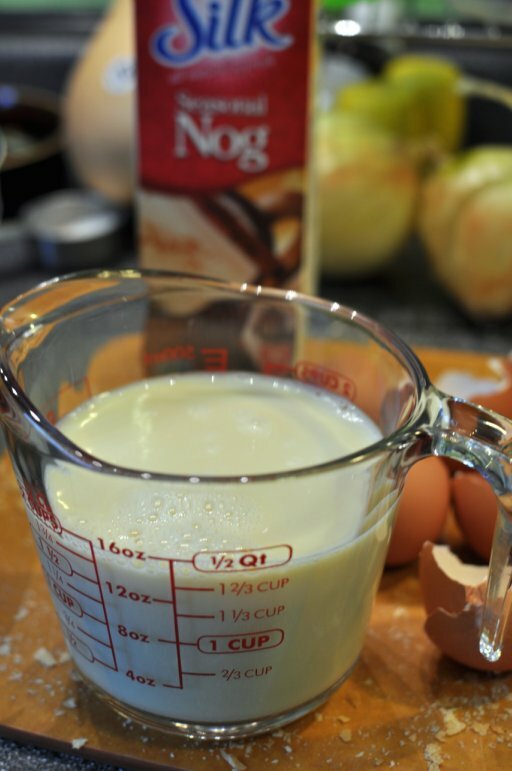 Put 2 cups egg nog in a bowl, whisk together with 1 cup milk, 1 tablespoon agave syrup (or 2 tablespoons sugar), 1 teaspoon vanilla, 1/2 teaspoon cinnamon, 1/4 teaspoon nutmeg, and 8 eggs. 3. Pour the egg mixture over the arranged bread. Sprinkle 1 cup raisins over the top. 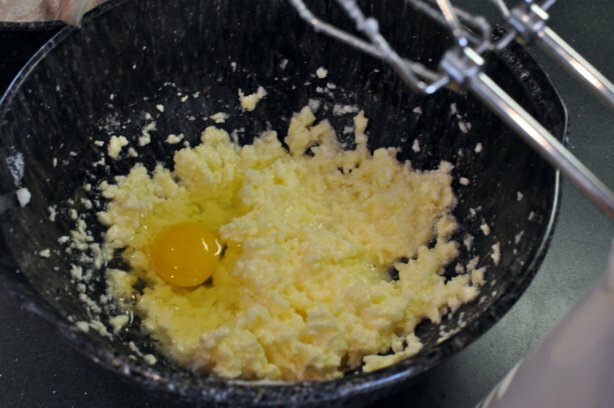 Use a spatula to press bread slices and spread around egg mixture, ensuring that all bread is coated in egg mixture. 4. Cover and refrigerate overnight. Uncover and bake at 350 degrees for 1 hour. Serve with warm with maple syrup.